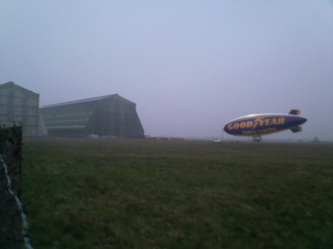 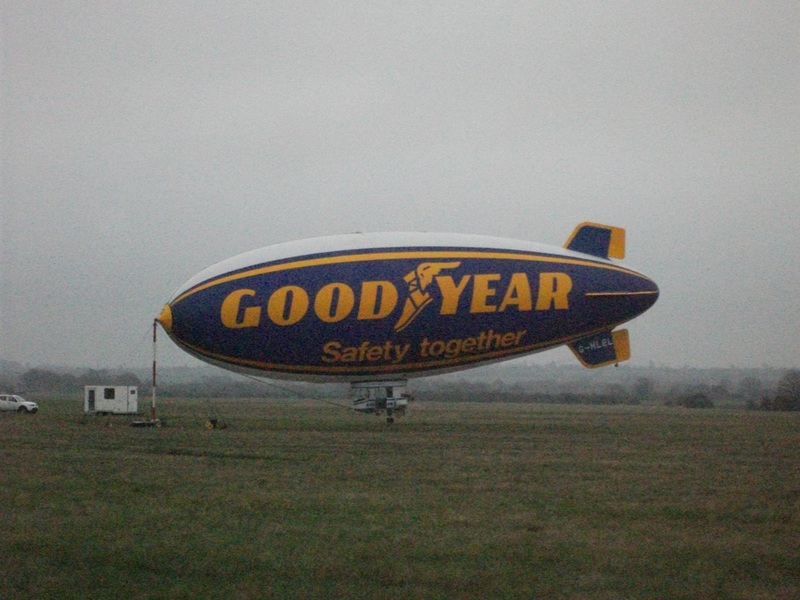 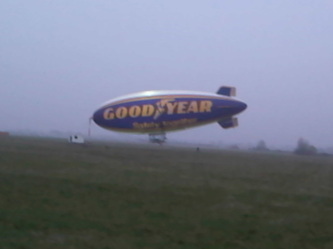 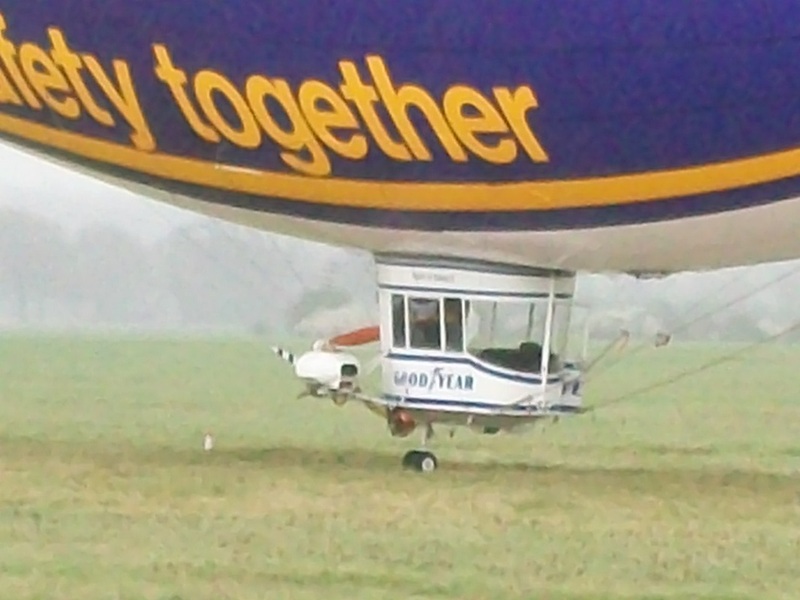 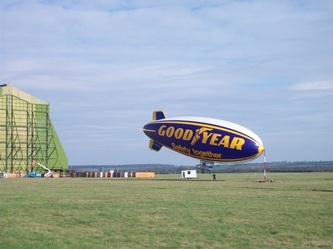 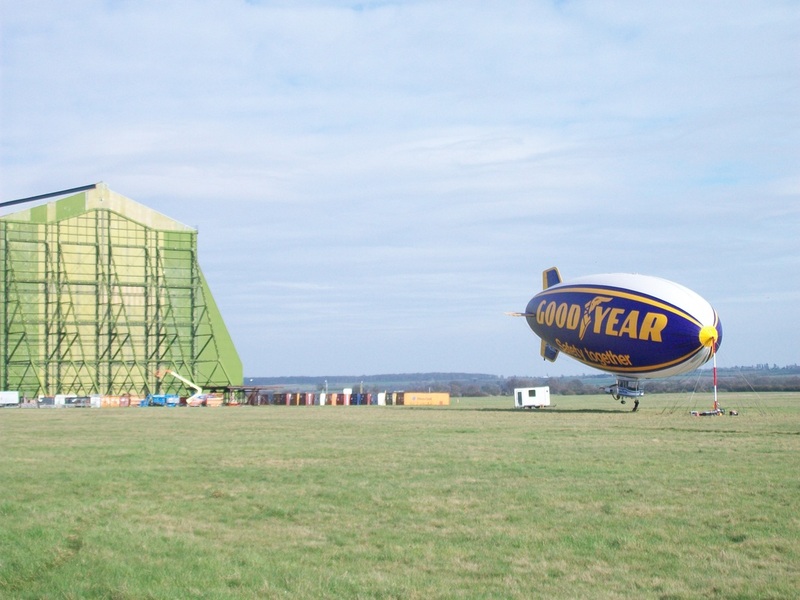 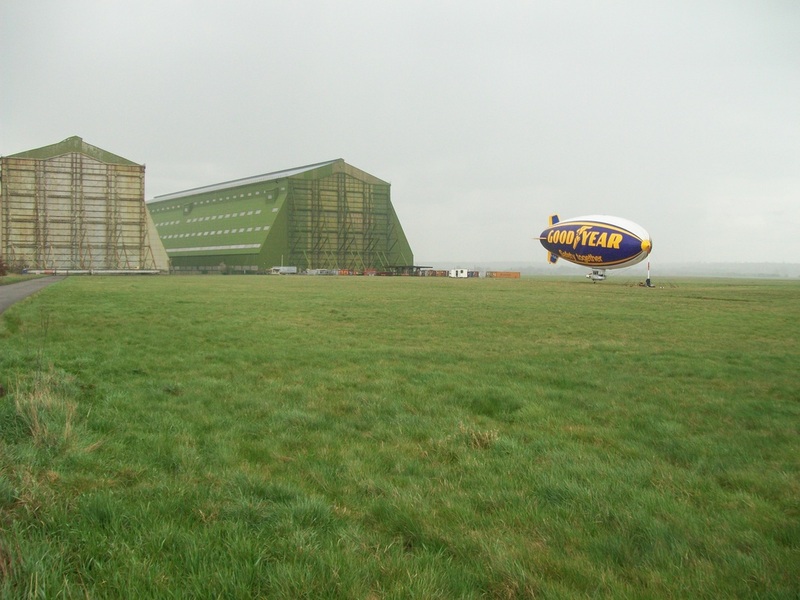 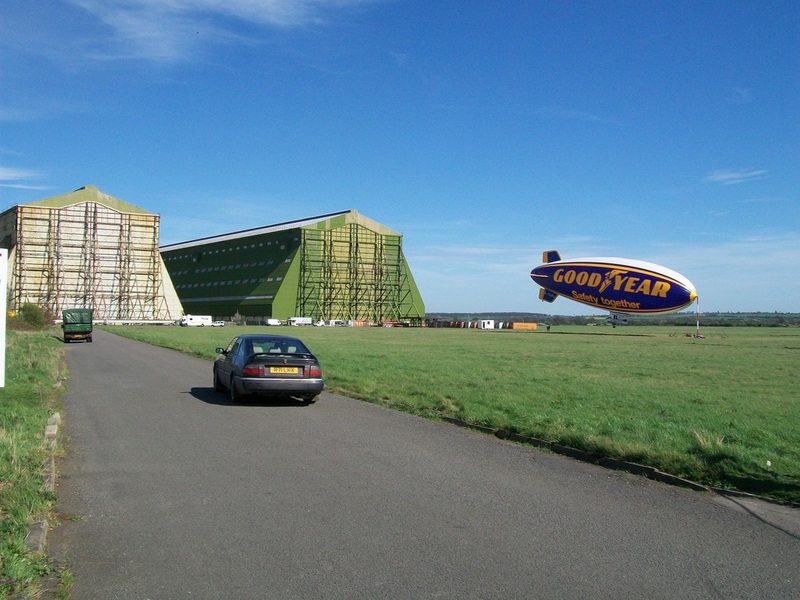 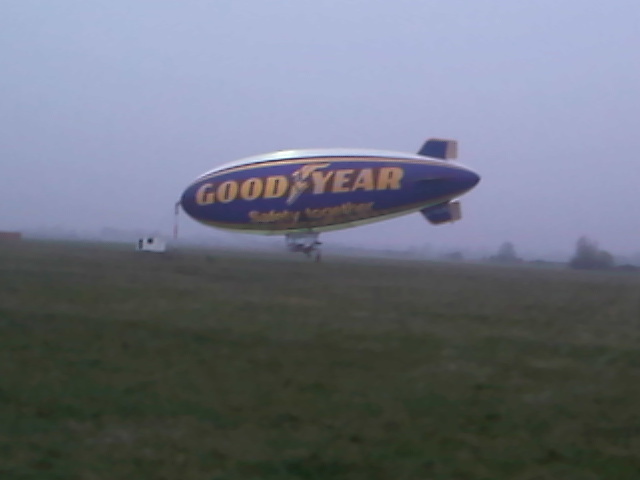 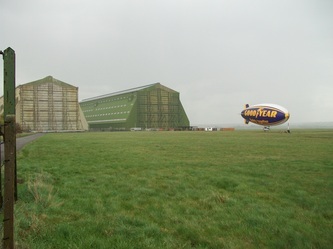 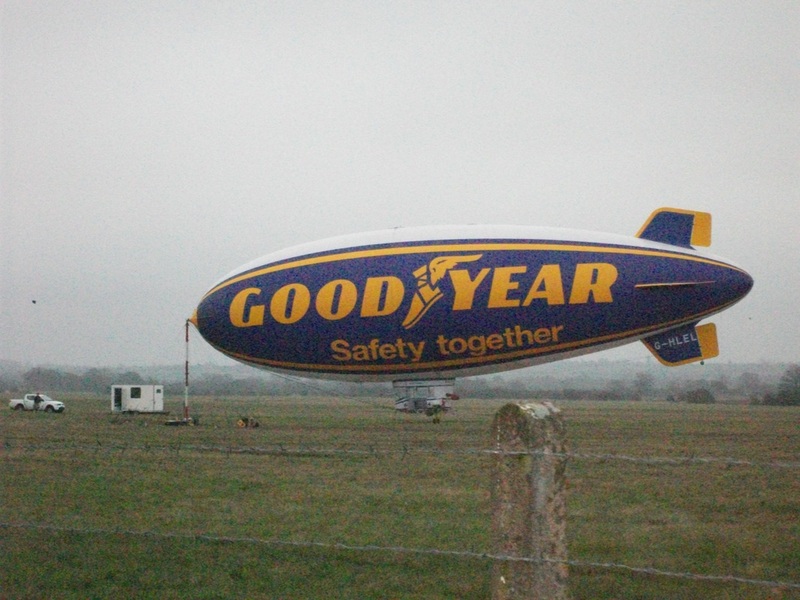 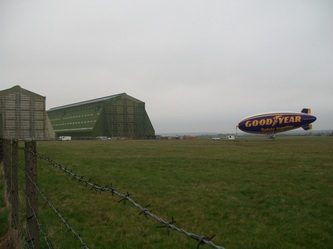 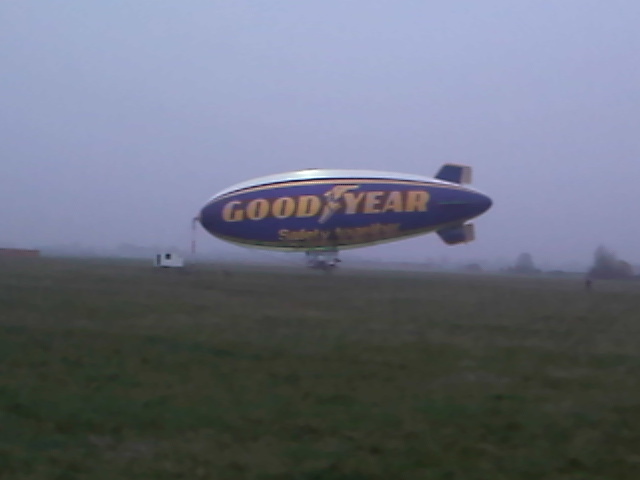 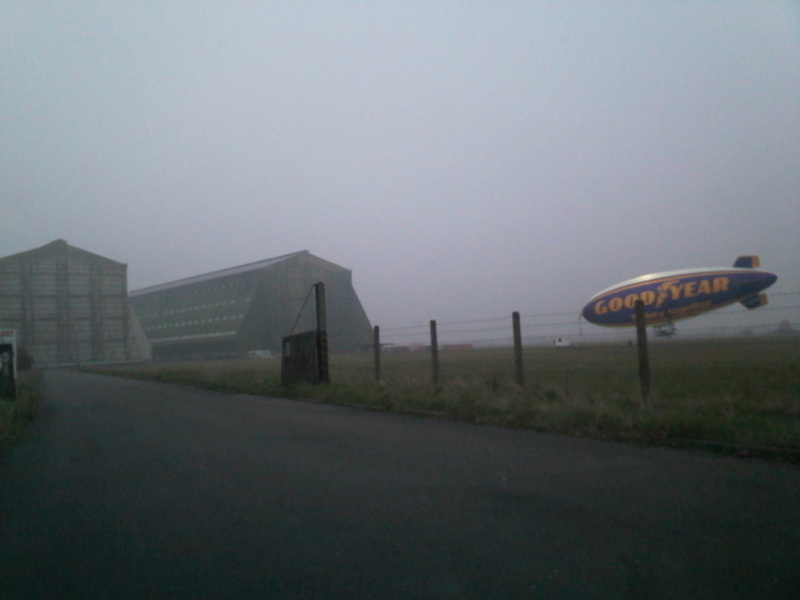 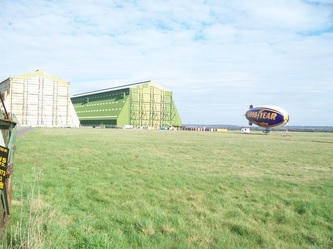 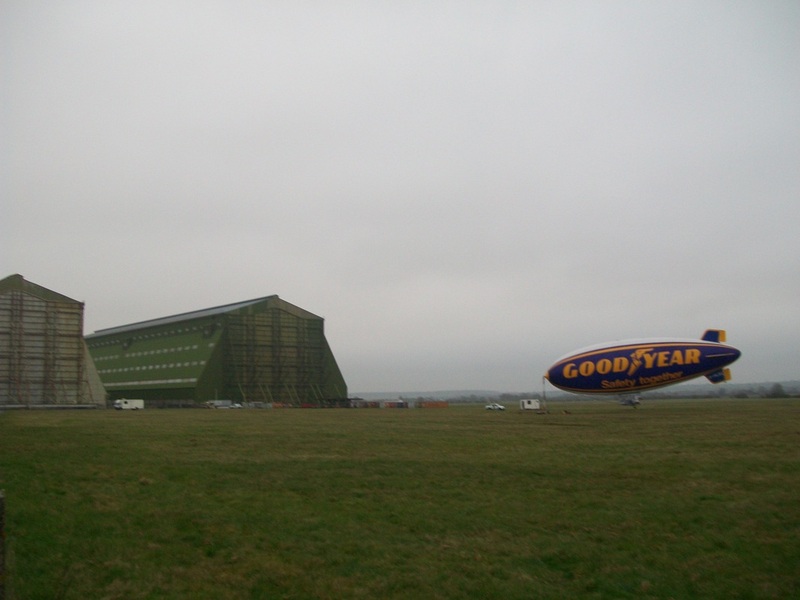 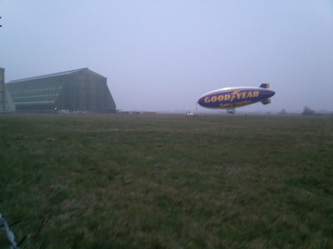 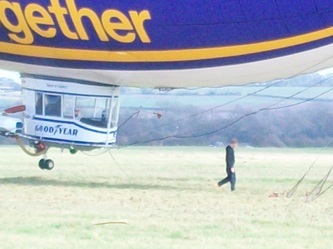 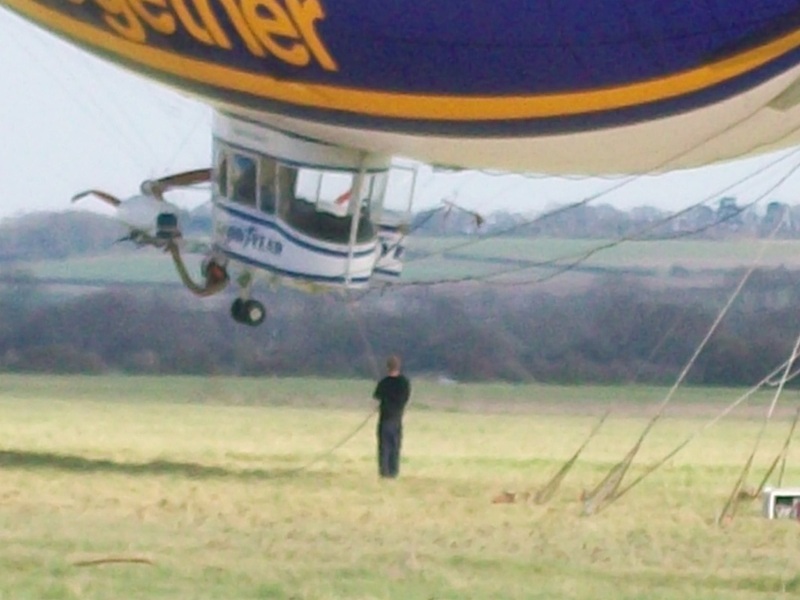 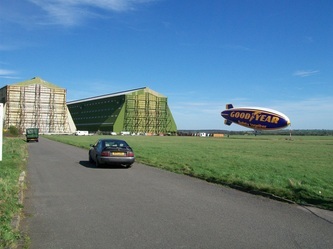 latest ship Launched at the Cardington sheds / hangars, Lightship A60+ Goodyear blimp spirit of safety 2. 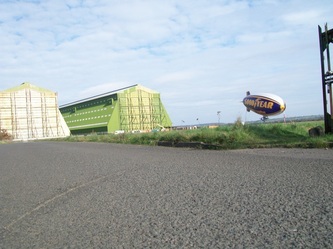 Below is all the latest news from the net and word of mouth on Cardington airship activity, any news on R101 R100 airship themed events are on the site, the site is new and i am learning so be patience, more good stuff is coming, watch this space. 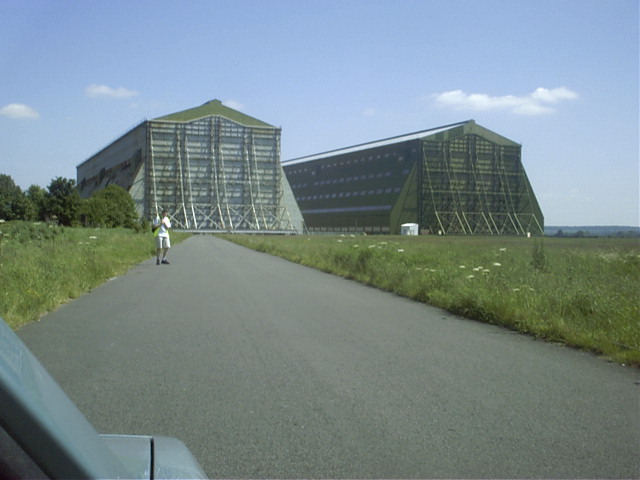 want to see what Take Thats huge stage looked like in shed 1 at Cardington, just found this video on youtube, some stills of the stage up in shed one, the holes in the roof actually look good in one pic, but they holes have gotta go. 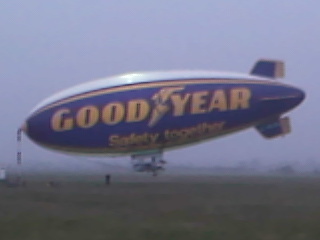 two cool video's found on you tube, one on the R100 and the other R101, links above. 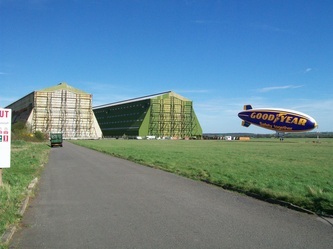 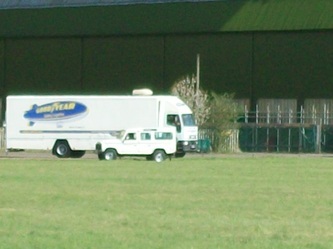 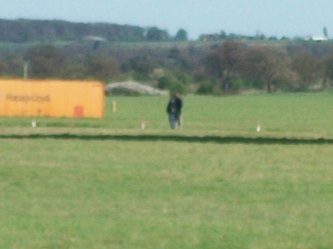 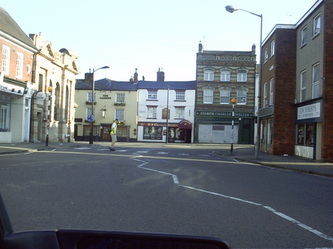 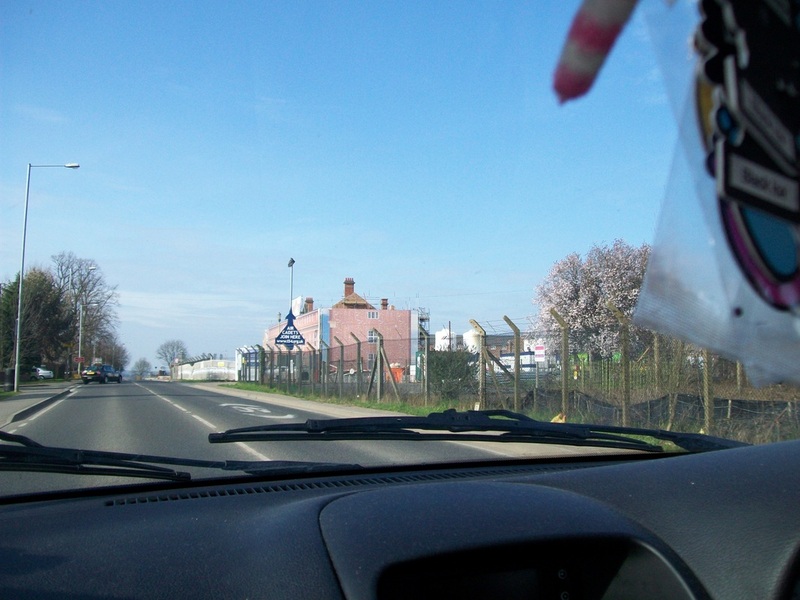 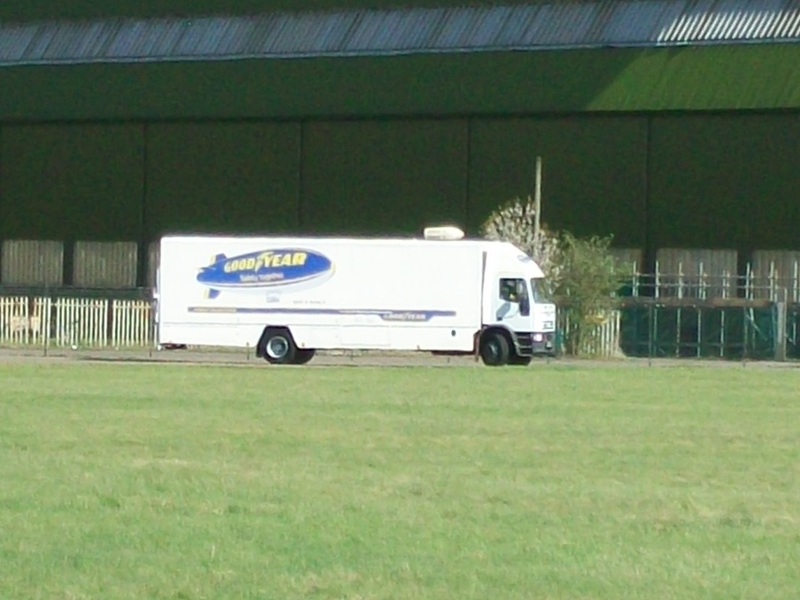 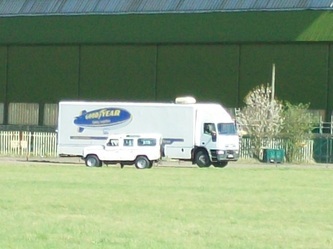 news on the grapevine that a cast member of East Enders has moved into Cardington, who could it be? 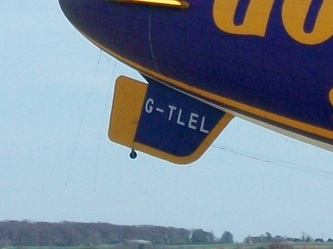 can you guess right? 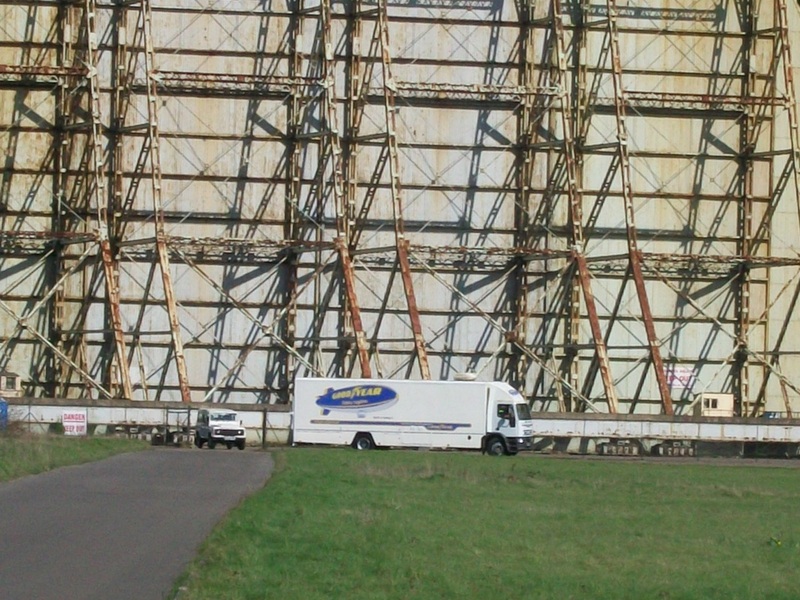 amazing footage of the roof of shed 1, terrible holes in this amazing building. 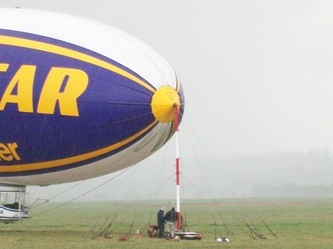 link above. 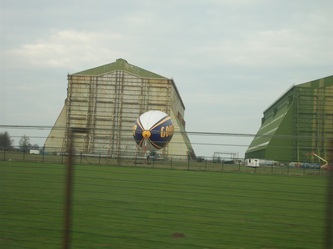 shed 1's doors open on the way home again, looks like they have been open a while, last night shed 2's door was open, all lit up inside, lots of bat set visible, looked impressive and that was with me driving by. filming of Christopher Nolan's next block buster Batman film continues. 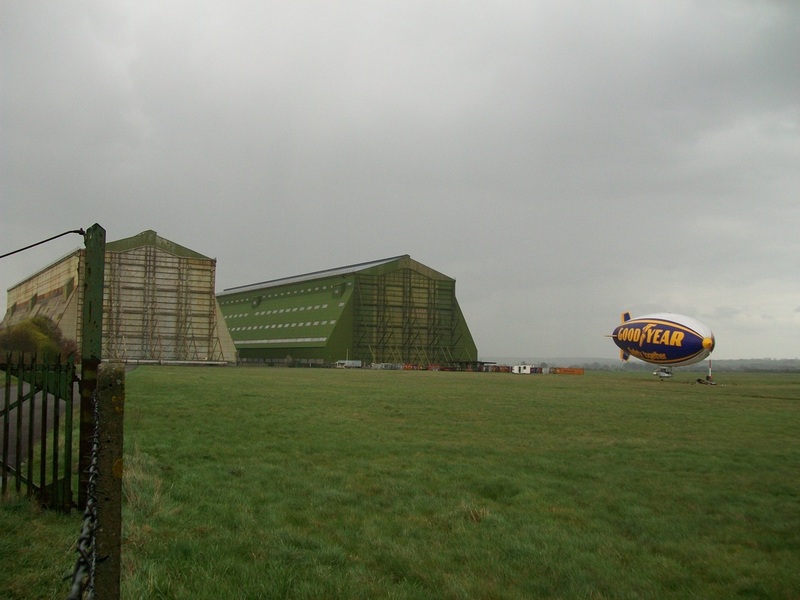 the dark knight rises due out next year, cant wait. Shed 1 and Shed 2's doors open today, not sure whats going on but the site was epic, is restoration coming, watch this space they have continued to clear the site so something is def afoot. 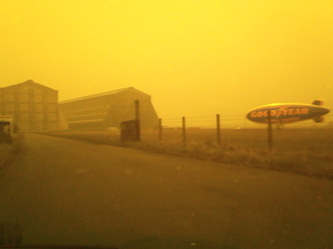 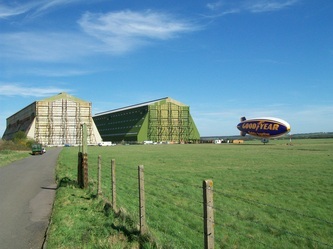 Cardington rocks!!!! some pics from my sponsored walk for the AHT few years ago. Cardington's Shed (Hangar) 1's only working door was open today, no idea what they were up too, might be the rest of the Goodyear gear moving out, the smaller doors to the rear of the shed were also open, something was happening, but what was it? no pics because i was driving and that's dangerous but if they are open any more and i have the time ill try and get some pics. to see pics of some damage to shed 1 take a look at the Cardington restoration shed 1 news page link on the main menu above, also on the page are pictures of the progress so far on the headquarters building. STOP PRESS I have got a flight, expect pictures news and hopefully a video too on the site, feel like a kid again, Cheers Goodyear. 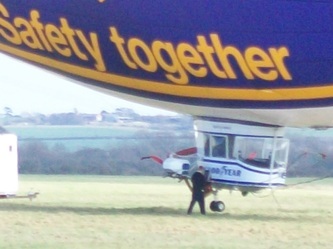 spirit of safety I and II HAVE SWAPPED NUMBERS, SOSII is now SOSI and SOSI is now SOSII. 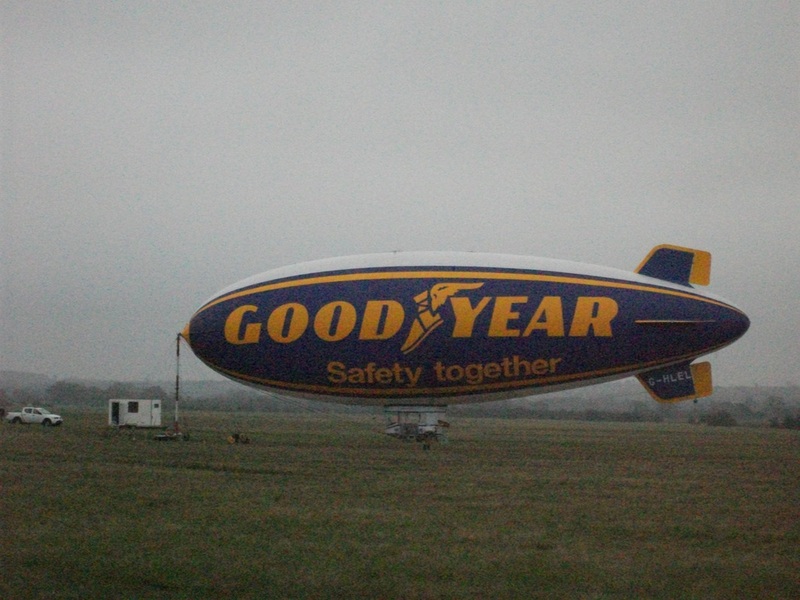 Goodyear spirit of safety is in France, heres pics taken by Thierry Detable heres the link cool photos. 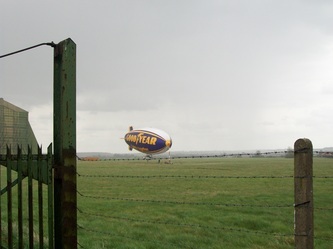 she left Friday the 8th of April to continue the UK tour, she flew off to Birmingham and as she went she flew right over my workplace, unfortunately nothing in hand to record the event but it was a nice goodbye. the nighttime footage below is very good, have a look. The results of the should the Goodyear blimp have a permanent base in the UK, well the yes camp def have it with only 4 in the no camp out of 39 votes that is a resounding yes, well for every one who too part, cheers, lets see what happens. 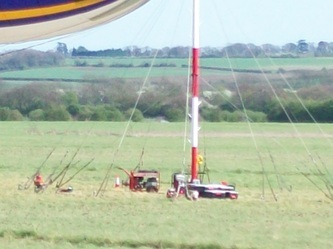 some shots of the mast and a few of some support vehicles. 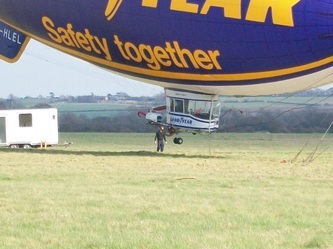 spirit of safety 2 is to continue the UK tour, Spirit of safety 1 is heading to France. Goodyear's spirit of safety 2 is still not out, just drove past the sheds sat the 2nd April 2011 and still no blimp out yet, however the mooring mast is up and ready for the ship so as soon as the wind dies down the door will open and the ship will pop out and get ready for her tour of Europe. 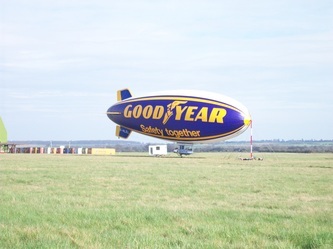 there are pictures of the finished SOS2 out there though find a few here on the facebook groups pictures blimp crew tavern, she's looking good. 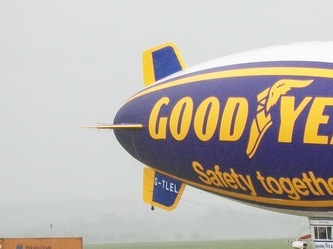 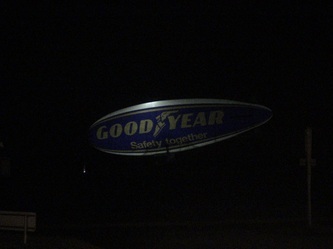 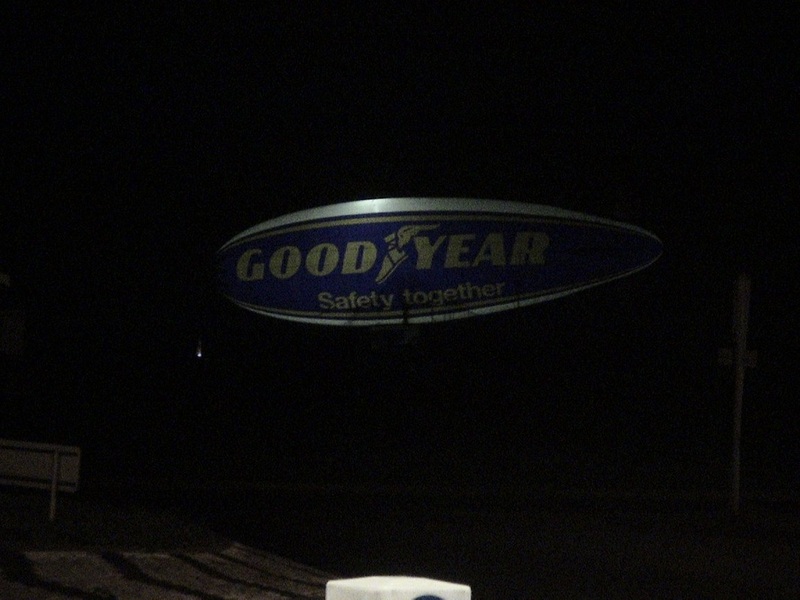 Goodyear's Spirit of safety 1 takes shape, goodyears fantastic video below. The Spirit of safety is flying above Cardiff again today, after an excellent flight over the England Wales game at the weekend, off to Birmingham soon continuing her message of safety on Britain's Roads. 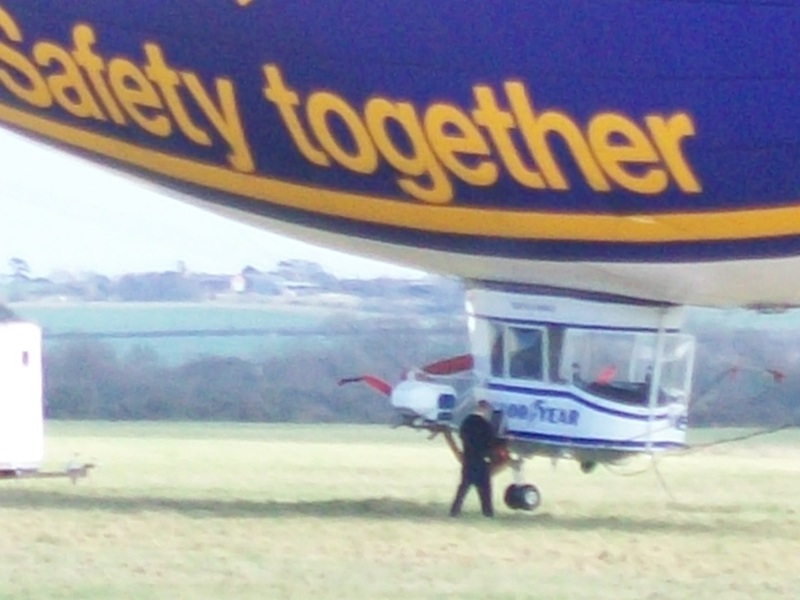 she has been well received and the UFO reports on twitter are dieing down, now the question is coming where is Spirit of safety 2? 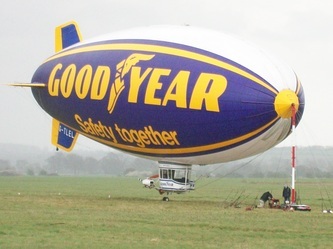 Goodyear official video, footage of "spirit of safety" over London. Well the Goodyear Blimp Spirit of safety 1 has left Cardington, tonight, wednesday the 23rd of March 2011 she will be over London, Watch those skies guy's, would love any pics of her over London and i will try and continue to follow her tour and report here, cheers. 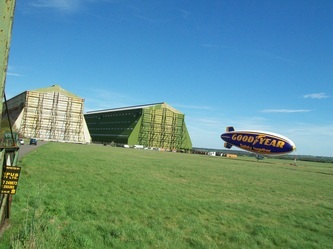 Heres my Flickr photostream,some of pictures of the ship, hope you like them heres the link Flickr . new video of the spirit of safety 1 flying at the Cardington sheds, on monday the 21st of march 2011.
small vid of the ship on her mast me and my boy took this afternoon, sunday the 20th march 2011.
new video taken by Ashley Luke Prater, also below are some of Ashley's pictures of the ship taken in the dark with its lights on full. also for those interested, we refer to the sheds or hangars as 1 or 2, shed 1 is the older of the two, built in 1916 in original form was 700ft long it was later lengthened and its roof raised to the size we know today, if you are looking from the A600 its the one on the left that is Grey and rusty and in need of restoration, this was the home of the R101 and where the R100 was dismantled, shed 2 is the greener restored shed on the right, it was home to the R100, it was origionaly built in Pullham St Mary in Norfolk but when the Imperial Airship Scheme started she was taken down and reassembled to her current size at Cardington, a huge macarno set of parts, she was home to R100 ans later used as a fire research lab, a BIG lab, any how today the shed seem second home to film director Christopher Nolan and films such as the batman trilogy of films he has and is making and also his huge success Inception had very large technical scenes filmed at shed 2 cardington, hope this helps when your looking at the sheds and wonder which is which? 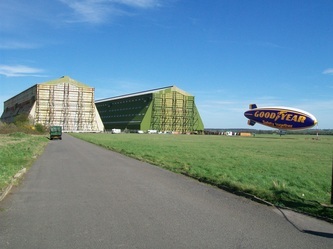 well she has left on her tour, cardington falls silent to airship engines once more, they will return. 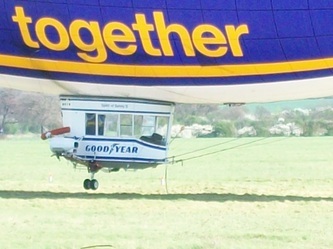 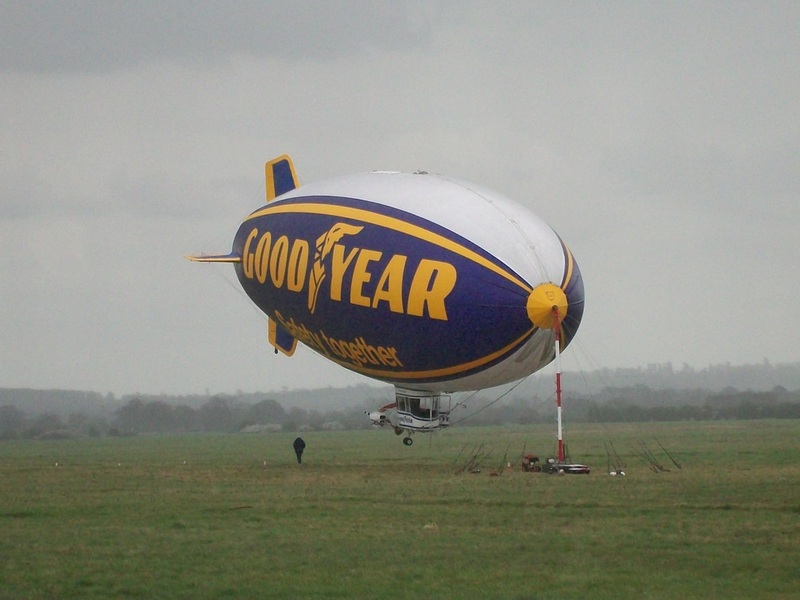 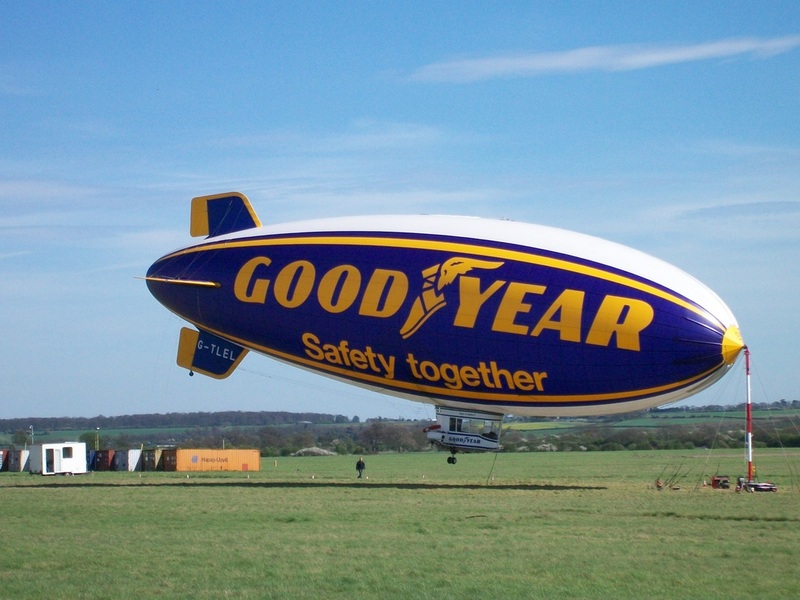 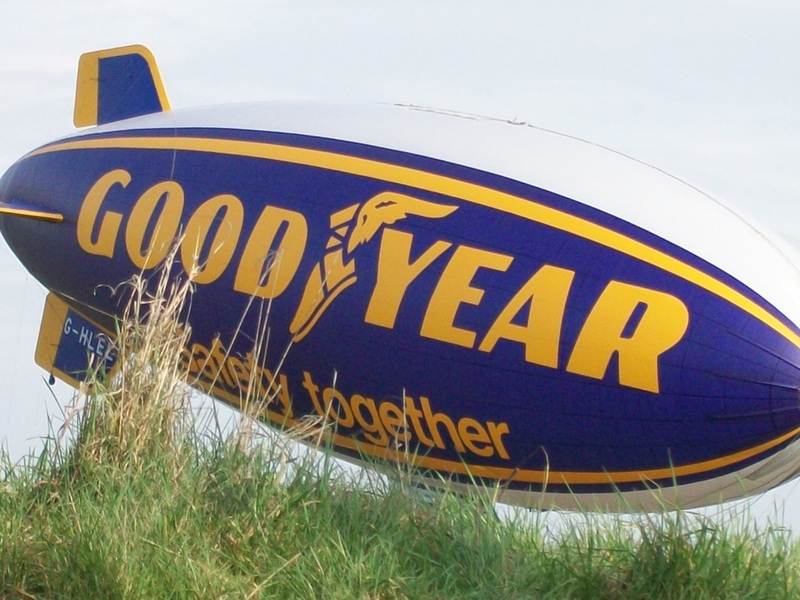 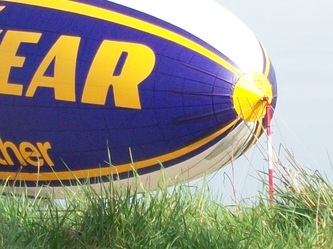 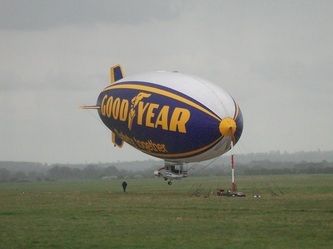 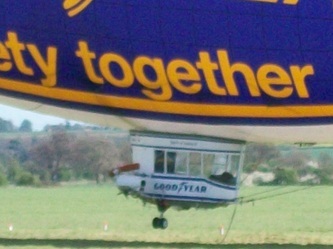 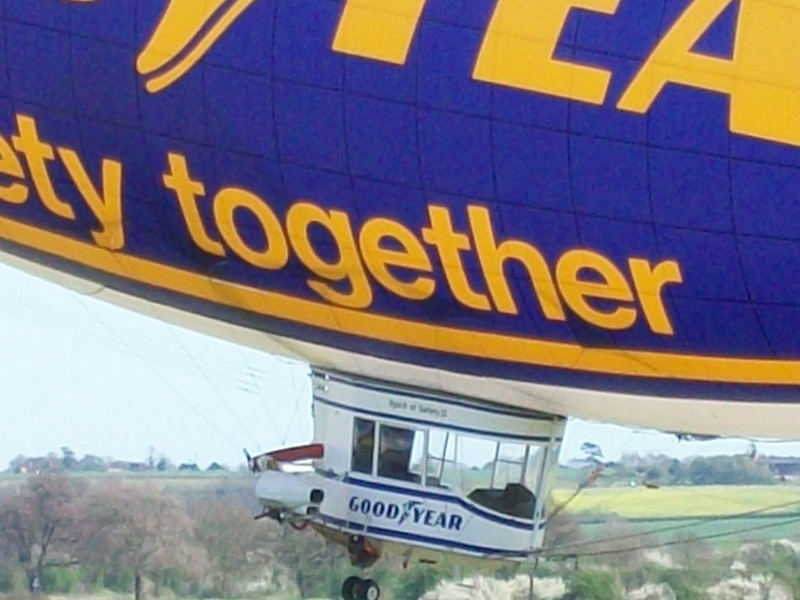 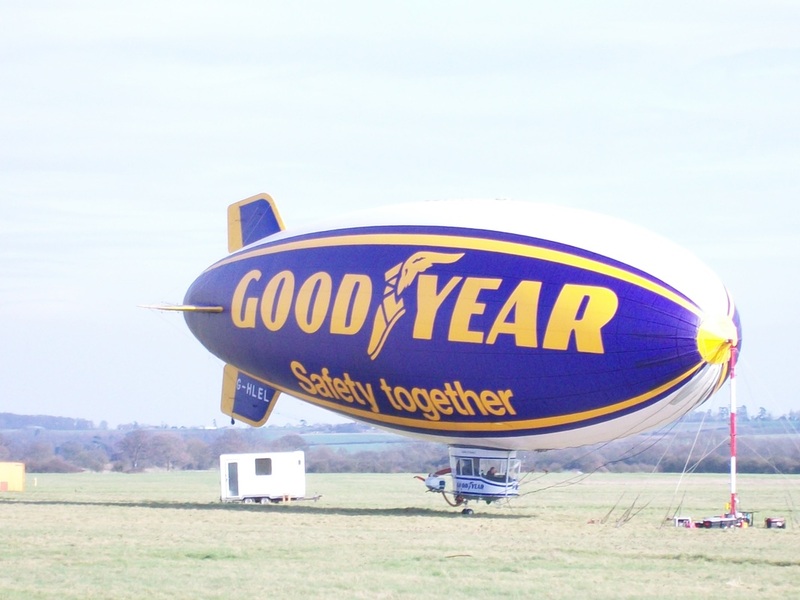 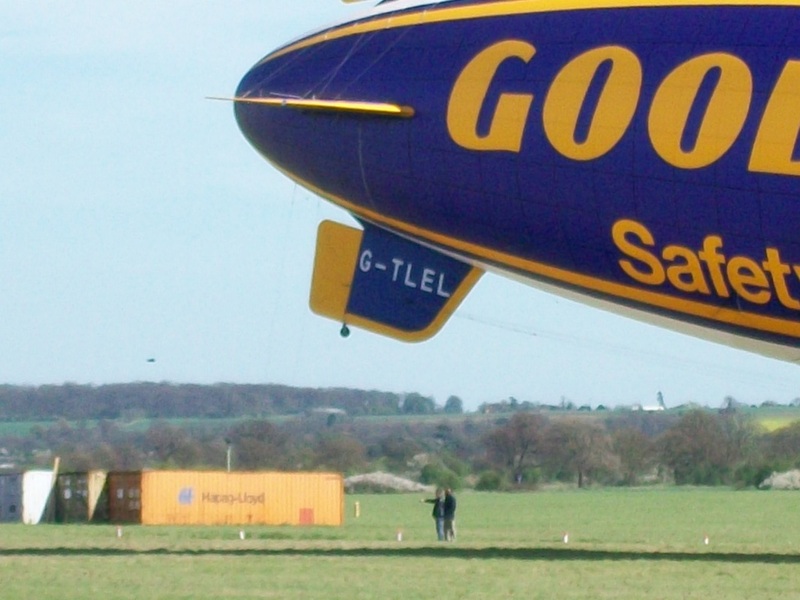 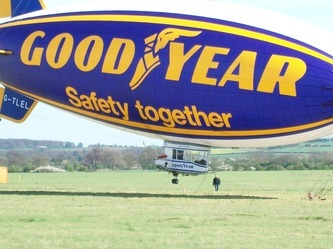 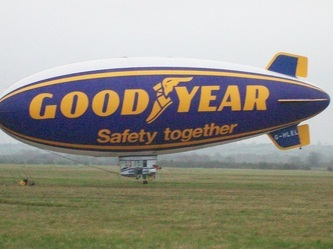 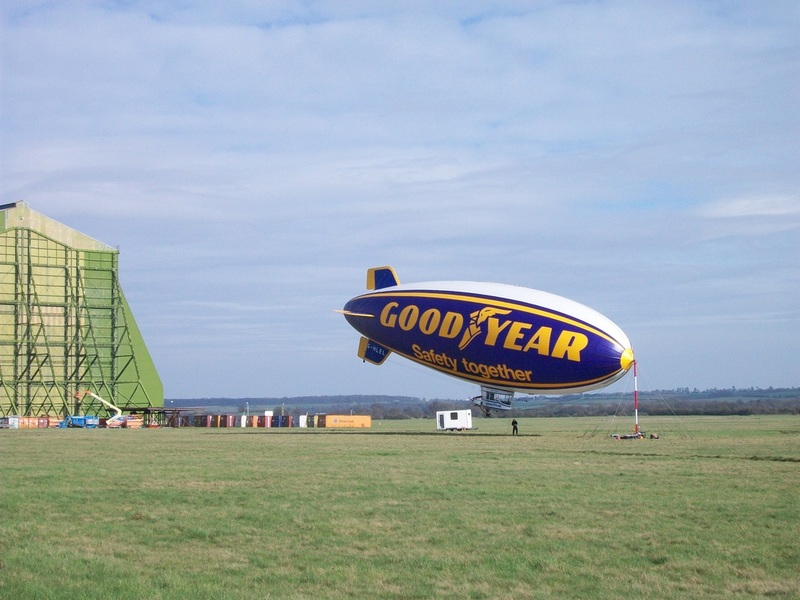 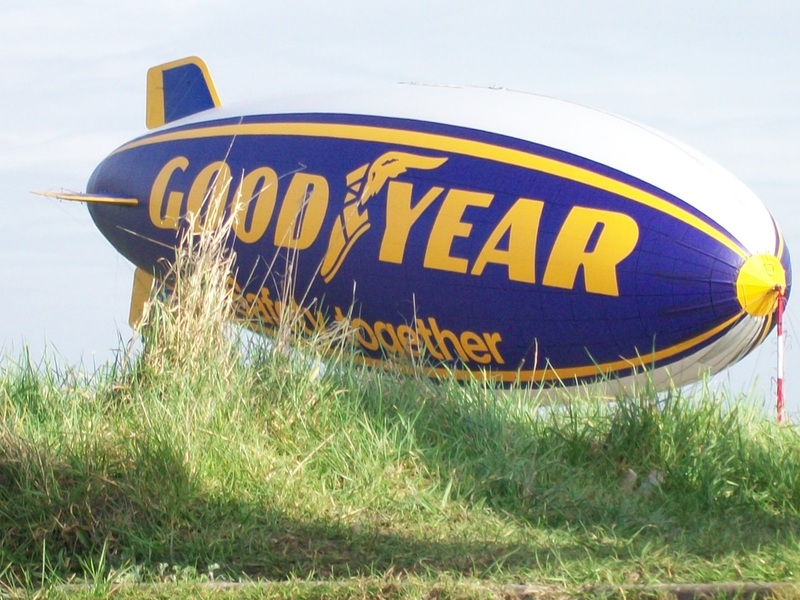 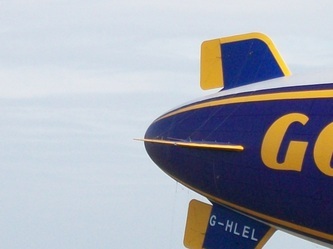 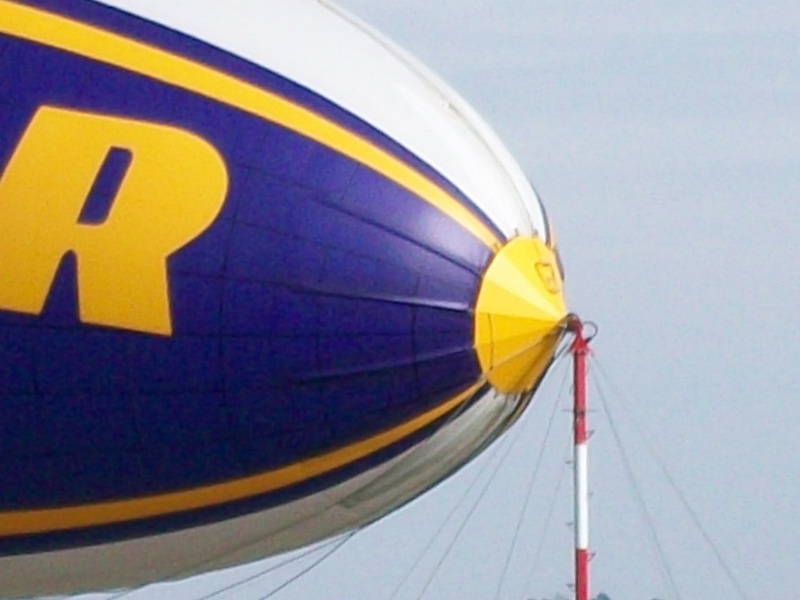 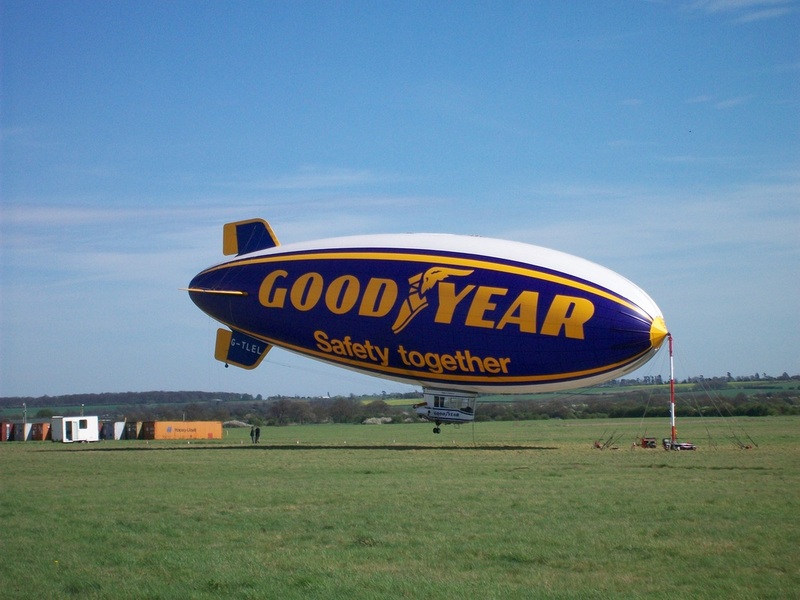 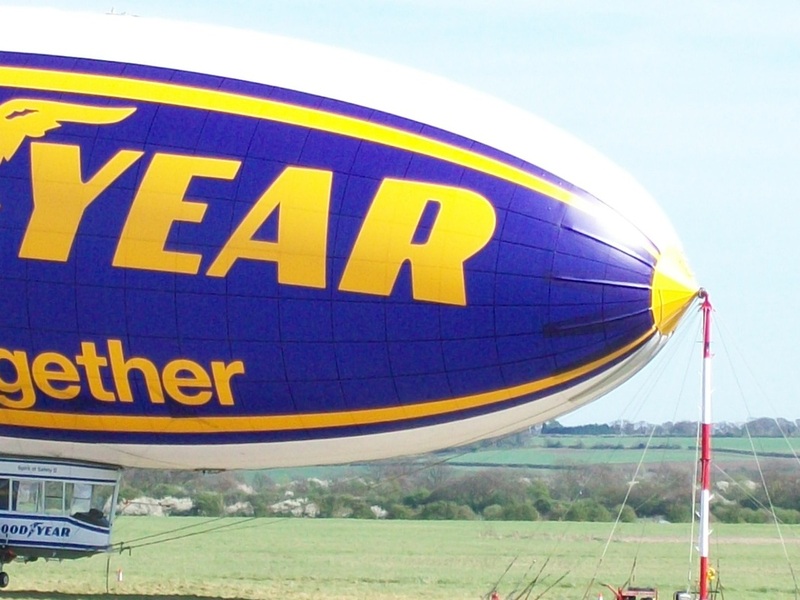 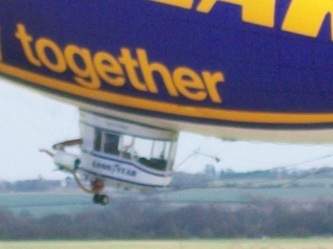 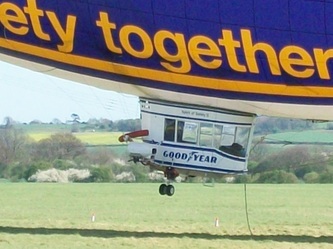 Goodyear tyres have been flying their blimps since 1925 when the first blimp, the Pilgrim took to sky's, also in the 70's, Goodyear assembled the Europa at Cardington. 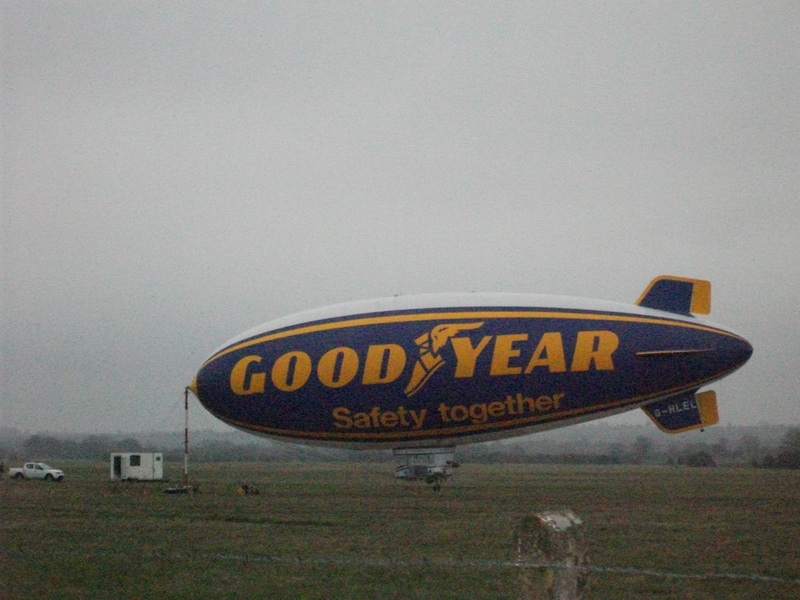 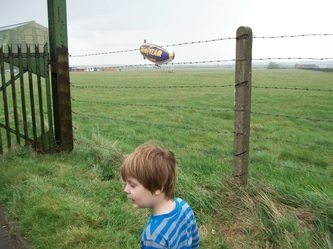 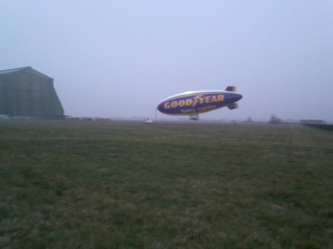 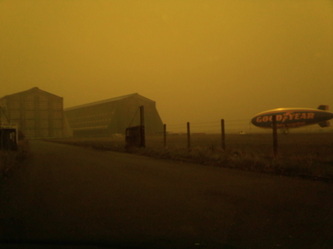 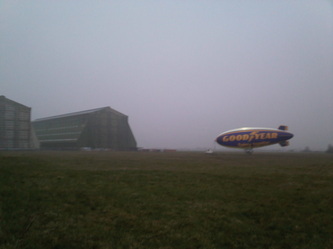 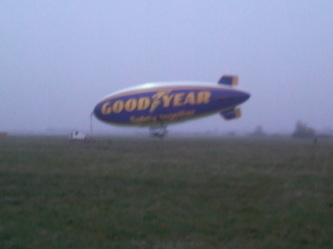 so welcome back to cardington to an old friend, the Goodyear blimp. 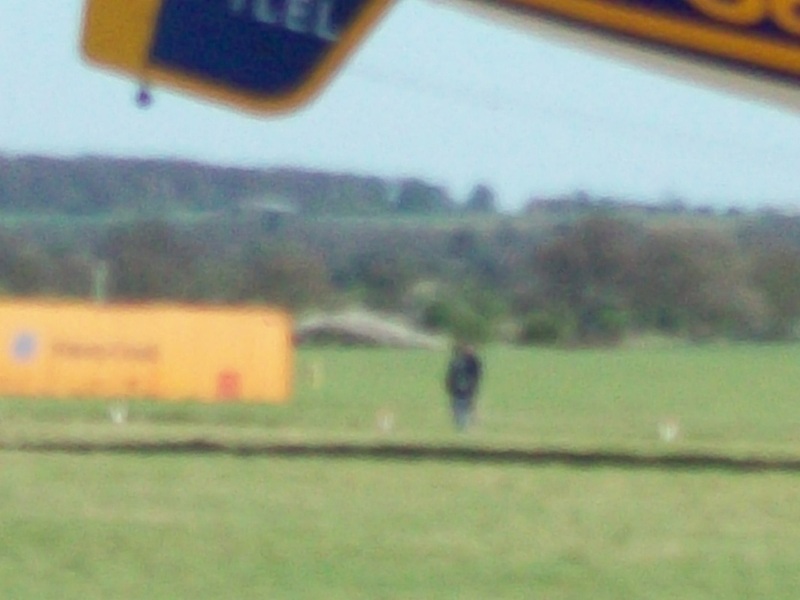 will keep you updated on flight news and hopefully pictures and vid clips, my dad has been forewarned, as per usual i might miss it all through work but hey ho. SHORTS Headquarters buildings roofs off, i think its restoration is well under way. 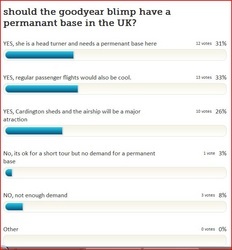 right heres the poll results, out of A total of 9 votes the clear winner is No, shed 2's ok but shed 1's for arships, which i think is right too, in the other camp there was a comment too "NO! 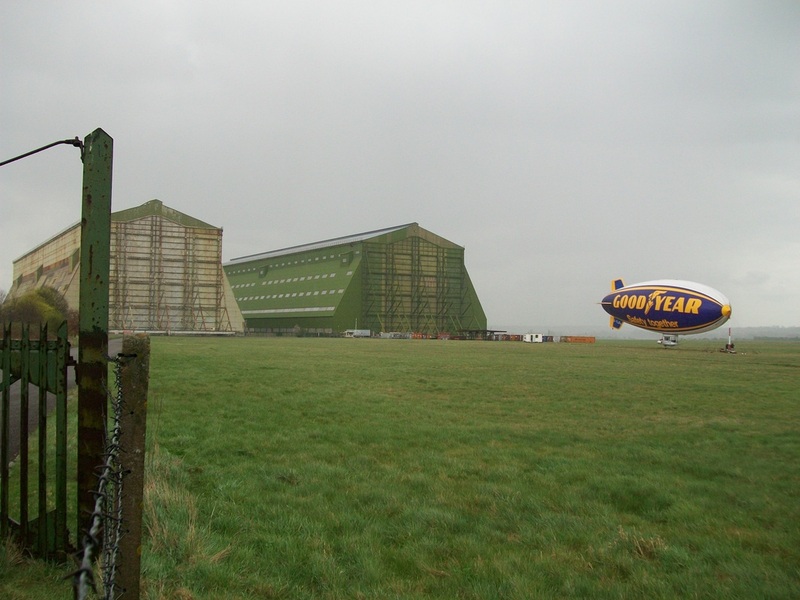 the cardington sheds are for the airships and the airships only" a fantastic comment and it goes to show that the majoritiy of visitors that voted want cardington to keep its airship connection. 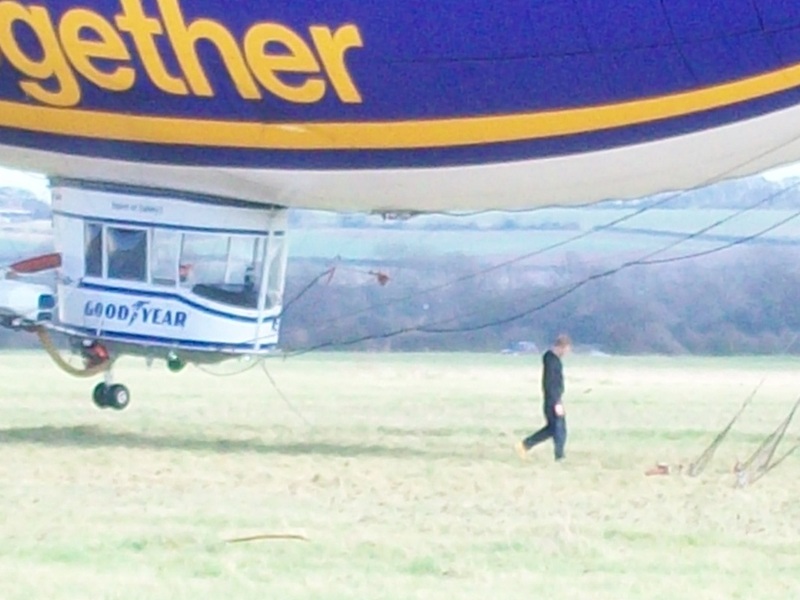 right woorking on new poll now, should be up in a sec. 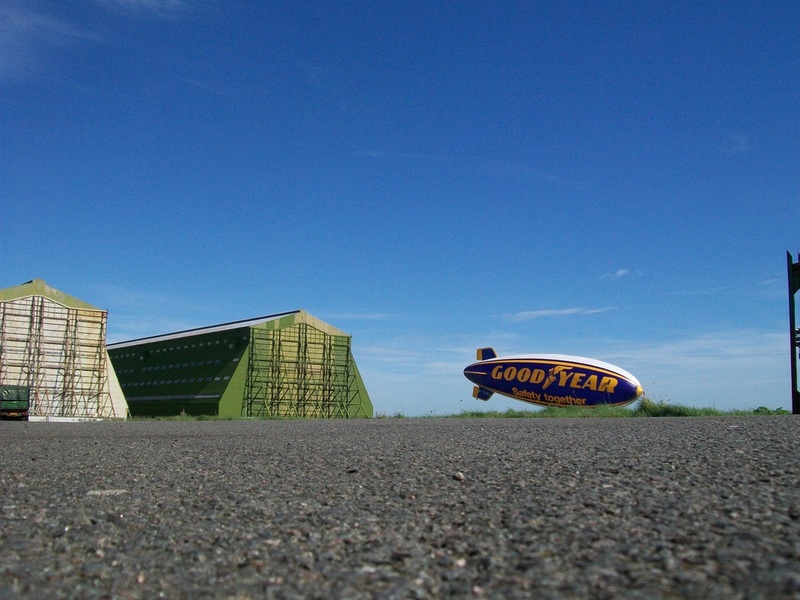 heres the results of last weeks poll, 18 votes in total and most leaning toward the no camp but it was very close. 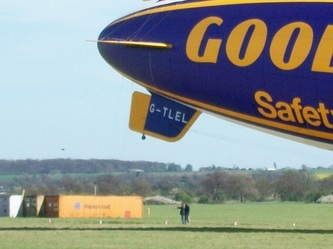 It depends on a suitable application that is funded to enable development! 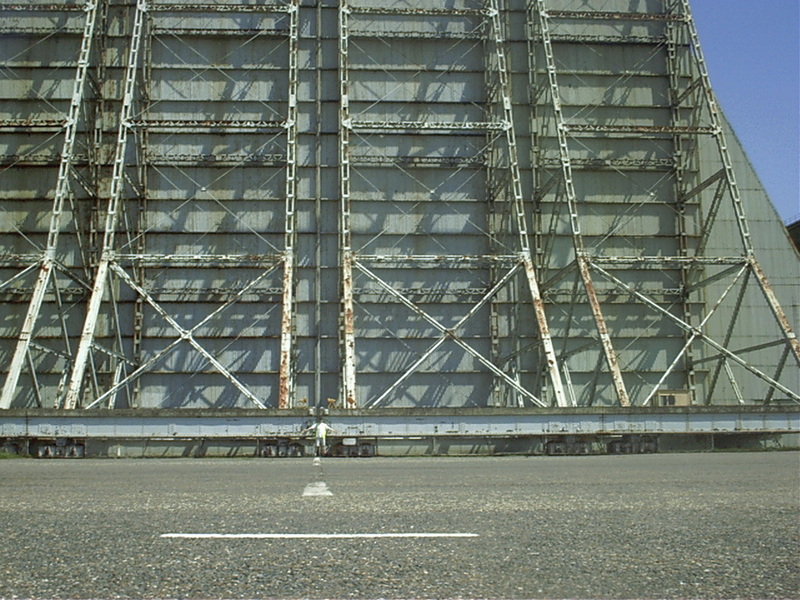 NO - the economics !!! 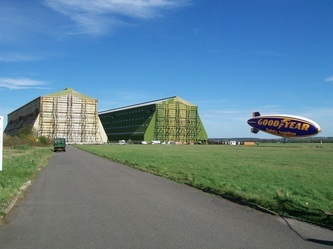 and it seems the yes camp have it by a large margin here, Cardington should have a future in LTA, 12 in the yes camp and only 4 in the no's, i really cannot imagine a Cardington without airships, it has it's gaps over the years but there is absolutely nothing like seeing an airship flying over the sheds, Long live Cardington. 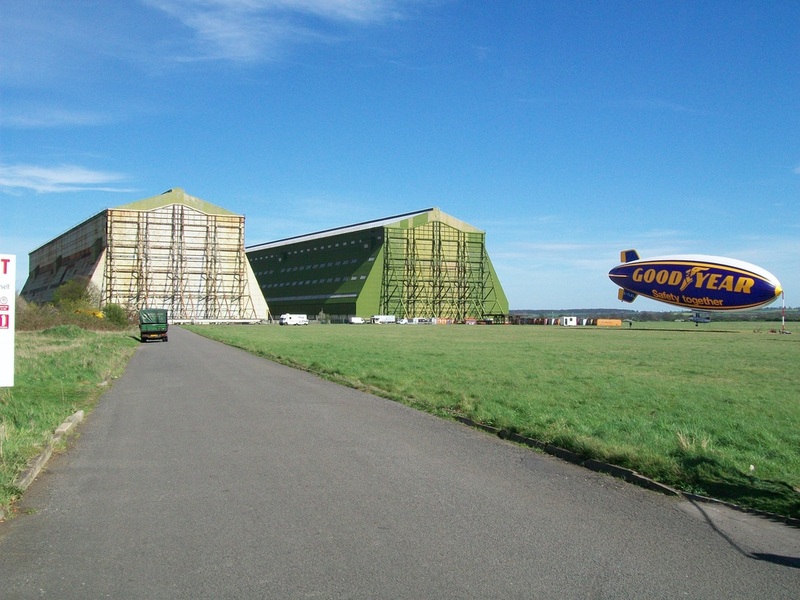 shed 2 was open yesterday, lots of stage work showing so something is happening, Christopher Nolan's new batman film is filming there shortly, dark knight rising. will keep you all posted. Betty spent many years working at Great Ormond Street Hospital caring for sick children. It was during this time that the R101 airship crashed in France in October 1930, killing 48 people. R100 R101 airships at Cardington exhibition at the bedford gallery, its open till the 19th of December. 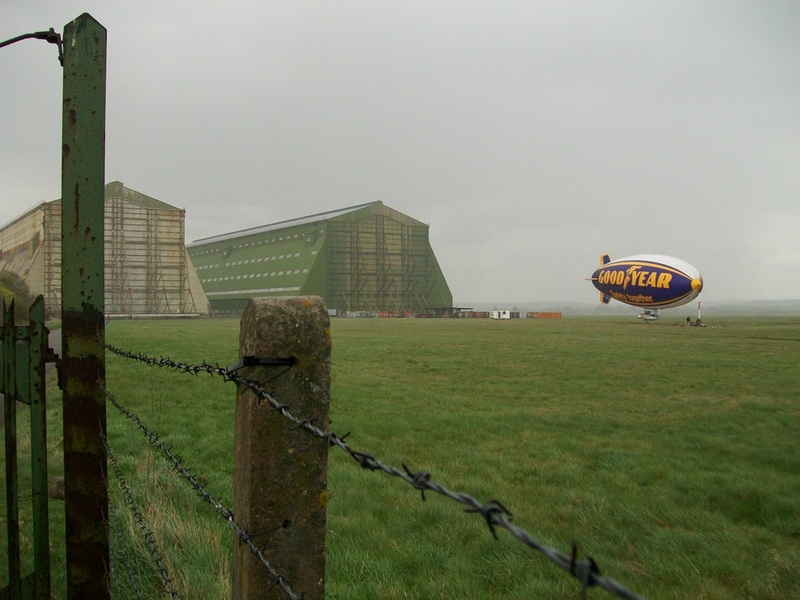 this is a must see, loads of original artifacts, footage and fantastic images, come and see. 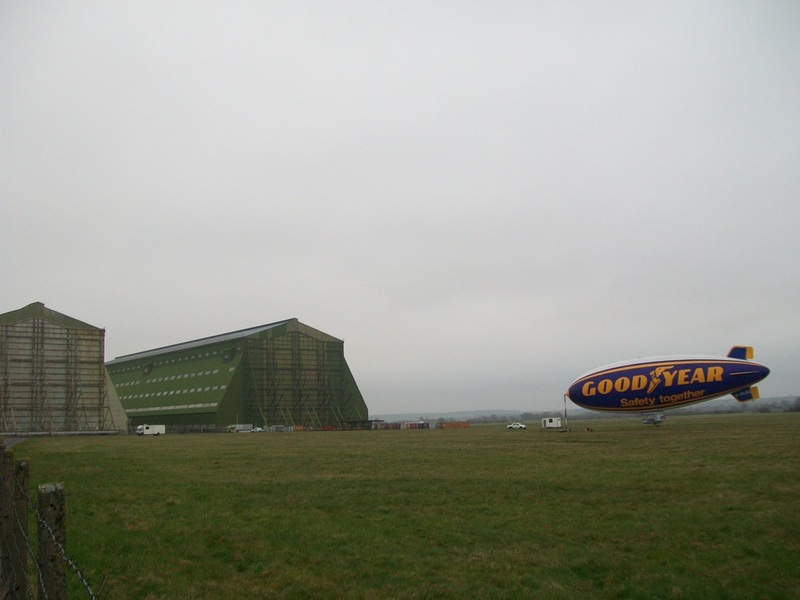 Until December 19 Health and safety may be taking a dive in popularity these days but on the inaugural flight of the R101 in 1930 a little more attention to a lot more detail might have saved lives. 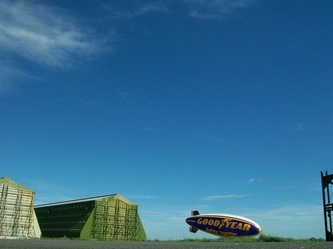 The world’s largest airship took off on October 4, 1930, from Carding - ton bound for Karachi, in what was then British India. Pressured into making the trip by the Air Ministry to ensure that the Air Minister Lord Thomson could attend a conference, the airship was never fully airworthy. 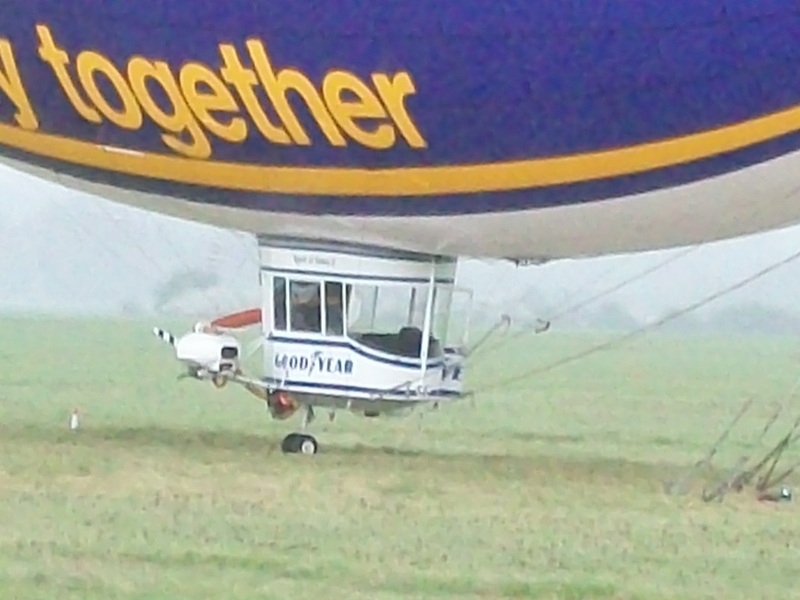 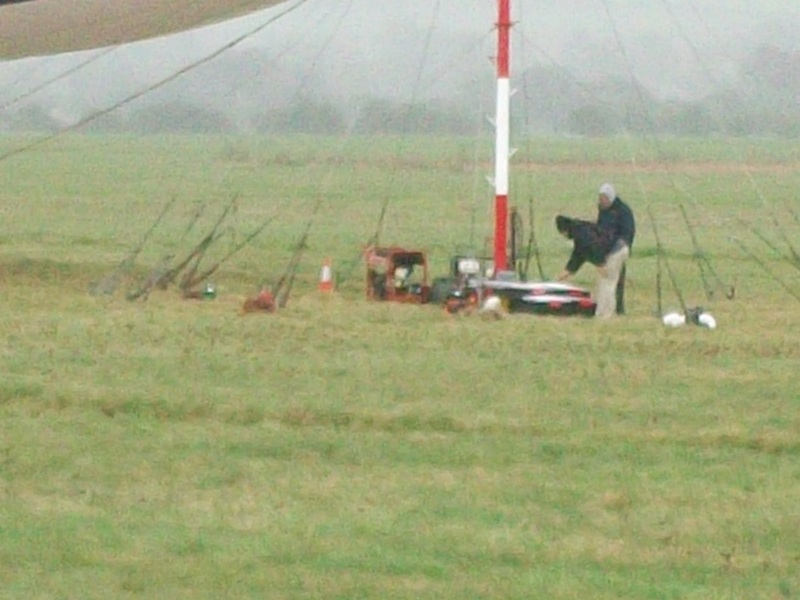 Bad weather over northern France scuppered the whole expedition and the R101 came down nose-first. The impact wasn’t so great but fire immediately broke out and 5.5 million cubic feet of hydrogen gas encased inside the stretched intestines of 100,000 oxen (yes, really) meant that only six of the 55 passengers and crew survived the blaze. 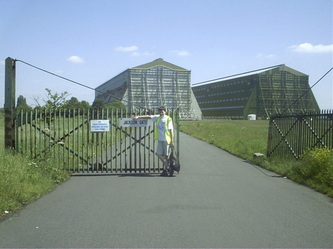 Most people in Bedford know a little of the history; if nothing else, the huge sheds at Cardington are a reminder of that dream of long distance travel in ‘luxury liners of the sky’. 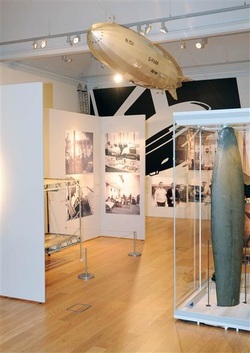 But this exhibition fills in the gaps in the story by way of contemporary accounts, the recollections of the survivors and the families of those who died, a few objects that did not burn to a crisp, design drawings and Pathé news reel of the construction of the R101. 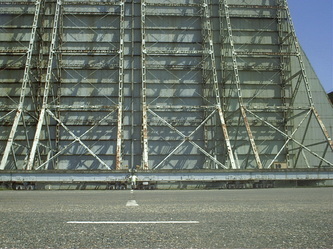 But it is the photographs, blown up in some cases to an enormous size, that are so striking. 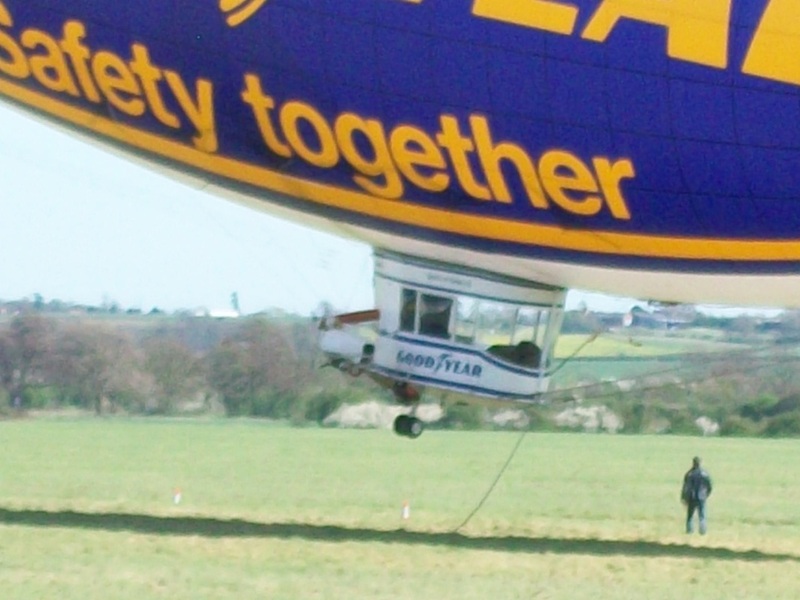 The smiling faces of the young crew who flew the doomed airship to the best of their not inconsiderable ability, the cheering crowds who watched it leave on its maiden but final flight and the images of the crash site with the broken skeleton of the framework like some fractured Meccano model. This fascinating collection of memorabilia is proof that a disaster such as the crash of the R101 is just as poignant and tragic a loss now as just hours after she made that final circuit of salute around her home town of Bedford one early October evening 70 years ago. With Leavesden out of action, Warner has several current or upcoming projects booked into other studios, including "Sherlock Holmes 2" and "Clash of the Titans 2." 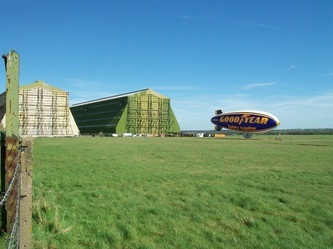 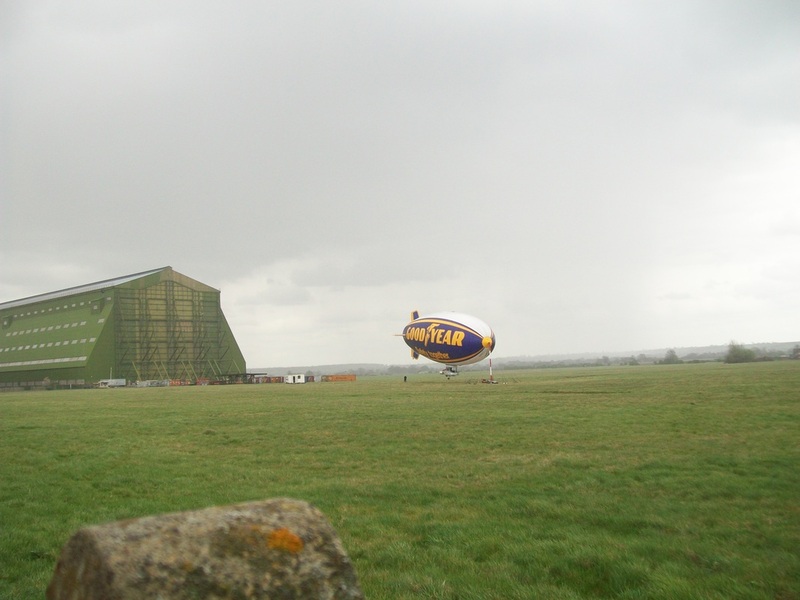 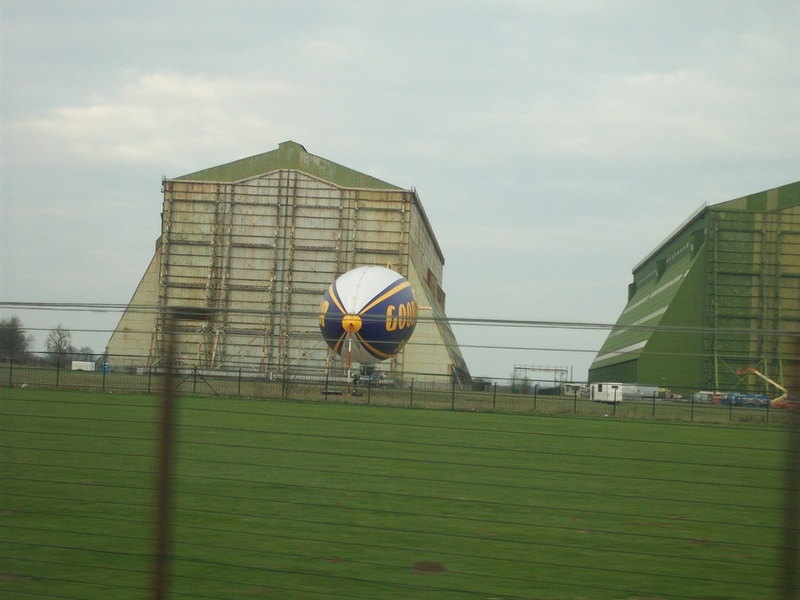 Helmer Chris Nolan will return to his usual airship hangar in Cardington to shoot the next Batman. 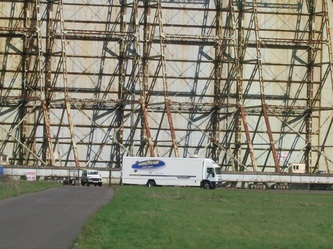 Last week Hero Complex confirmed where The Dark Knight Rises would not be filming, and now Variety knows where it will. In a recent article, Variety confirms that The Dark Knight Rises crew will be heading back to the Cardington hangars, which sit just outside of Bedford. 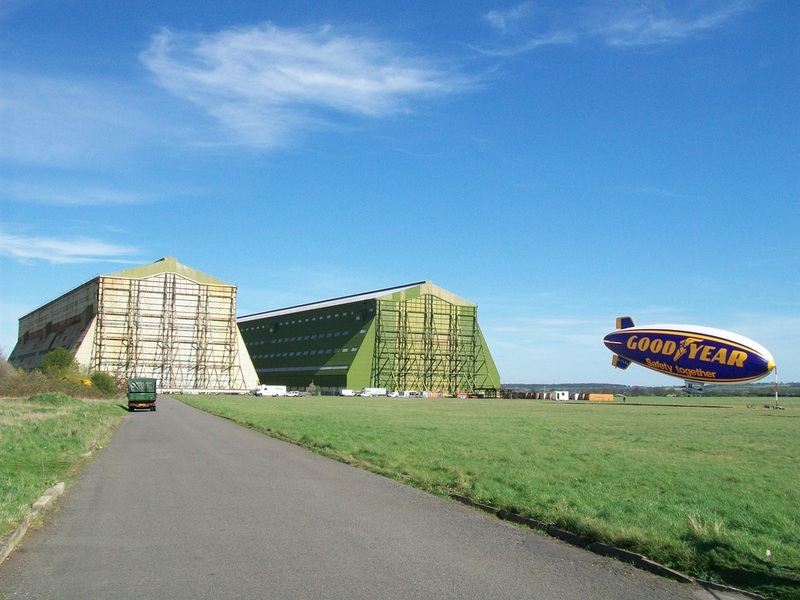 This isn’t a huge surprise, both Batman Begins and The Dark Knight were shot there. Hopefully we’ll see the return of the Batcave, Wayne Manor, and the Narrows, all of which are over in the UK. I think it’s safe to assume production will also be returning to Chicago as well. 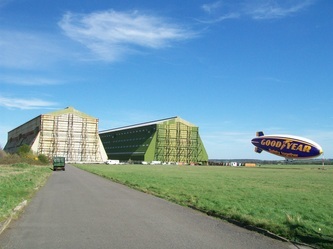 In another bit of news, production designer Nathan Crowley will be returning for The Dark Knight Rises. 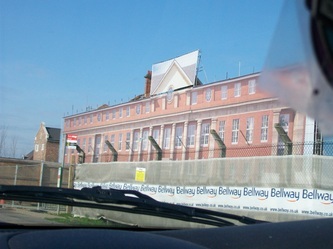 Crowley has previously worked on Batman Begins and The Dark Knight. Production is scheduled to begin in May 2011. 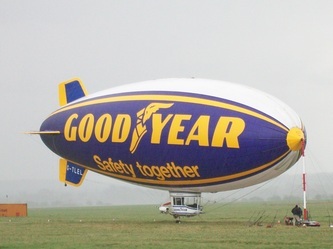 Stay tuned to Batman-News.com for all the latest news leading up to The Dark Knight Rises‘ July 20th, 2012 release. 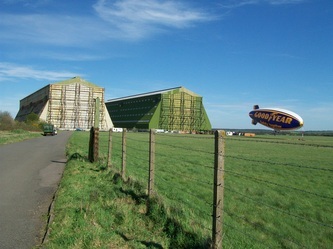 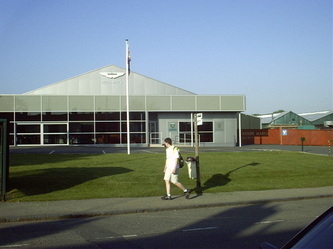 Airship Heritage Trust site sales page, loads and loads of airship stuff for sale, t-shirts and books. 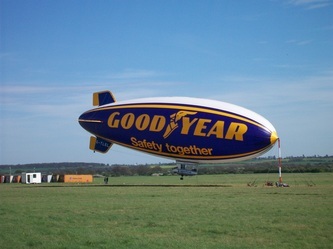 a BBC news report on Hybrid air vehicles HAV304 / skycat airship. 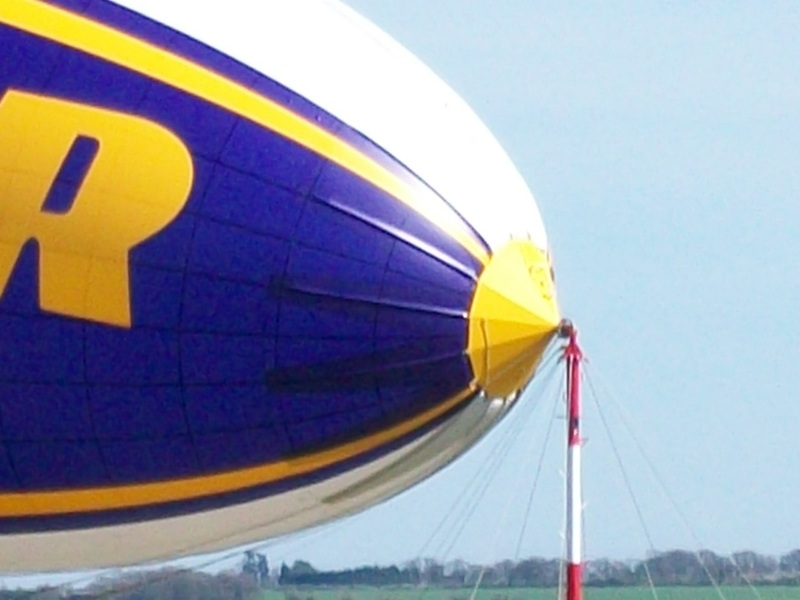 first poll and the winner is the airship R101. 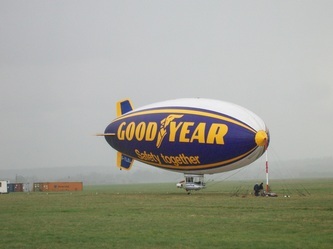 R100 and R80 come in 2nd and 3rd while R34 share's 4th with the R38, R36 was 5th. 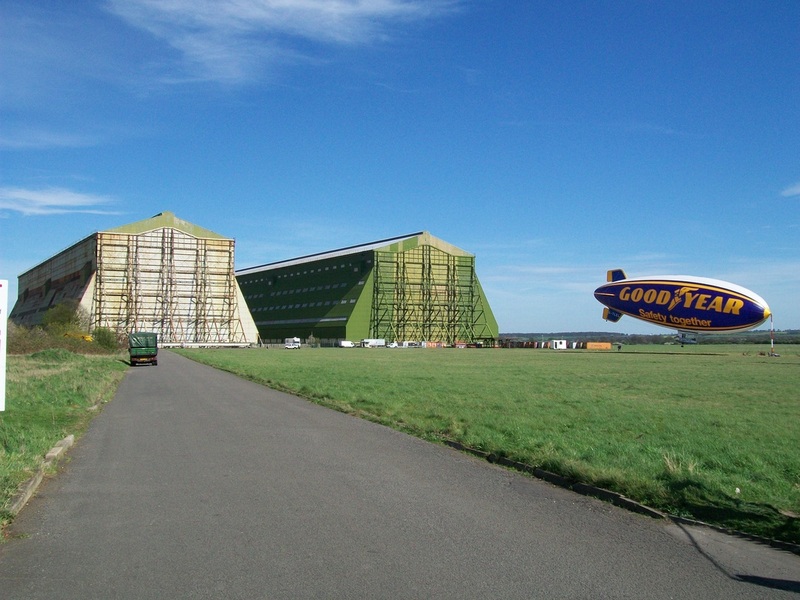 surprisingly R33 had no votes neither did R31 or R32, R33 was the longest serving British airship and was scrapped after about 10 year's of service, R31 and R32 were Cardington's first airships, R31 and R32 were wooden framed airships based on the Shutte Lanz ships, they were so flexible during tight turns crew standing along the central walkway would lose sight of each other. 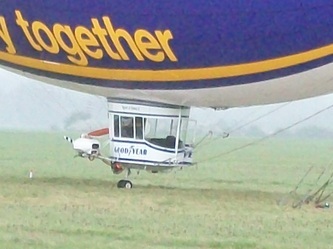 the mystery other voter never mentioned their favorite ship. 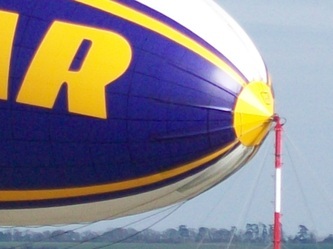 remember the comment button. 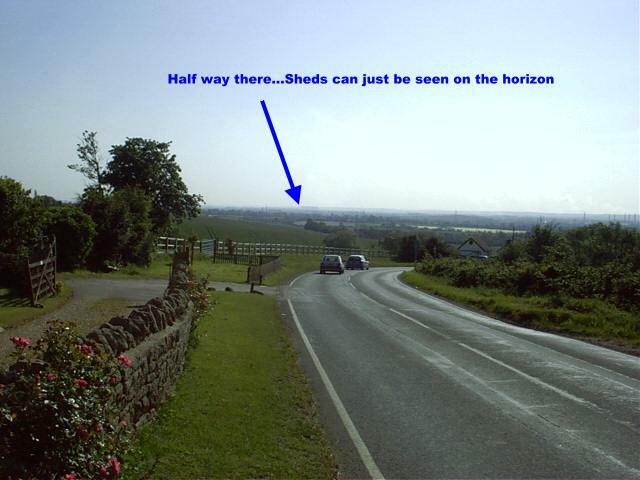 right its the second poll and below are the results. well the LEMV was covered by skycat. the no voters were the AT-10, WHAT were you guys thinking of, it was a fantastic design, short lived and never met its full potential but fantastic all the same. 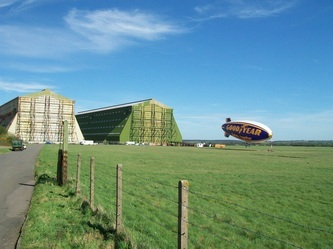 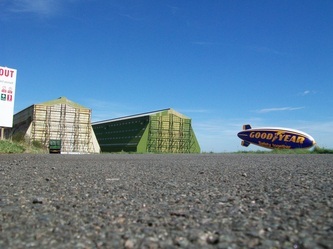 What do you think the best use of the Cardington sheds is? 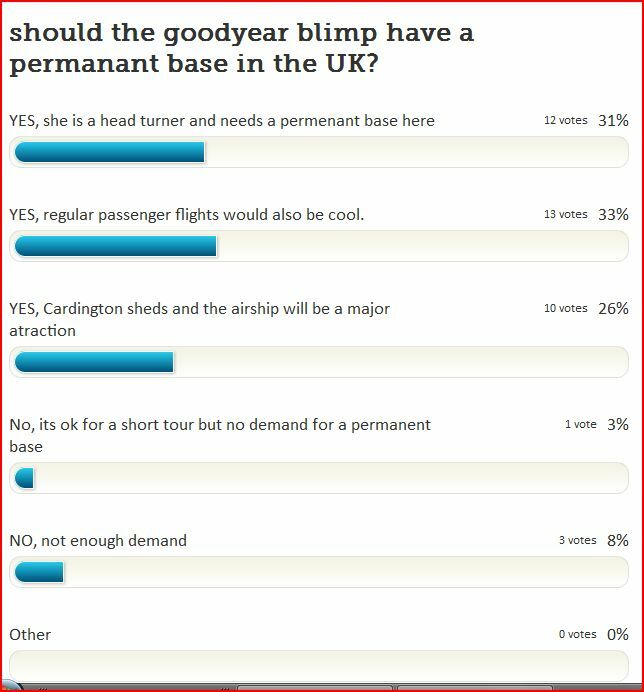 right it's results time again, i liked this poll, one it has my biggest amount of votes and secondly the result is what i think. 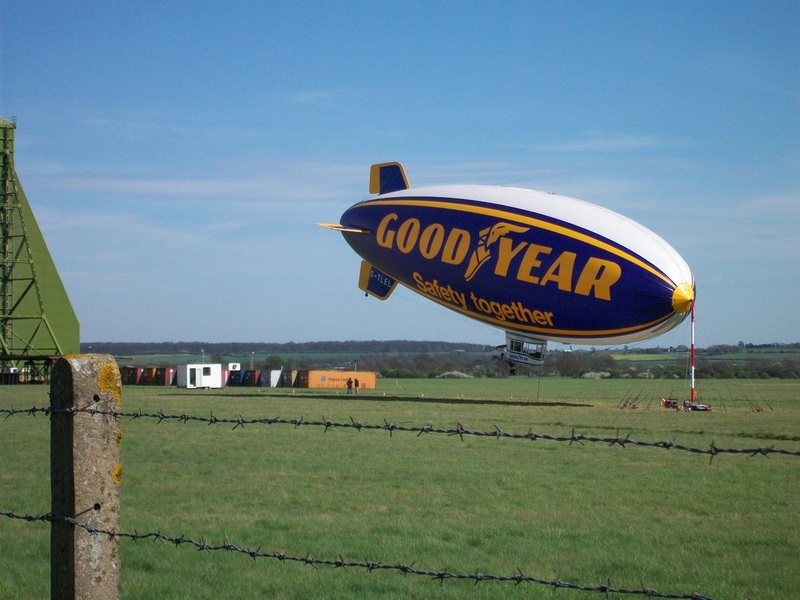 coming in at number one is, airship production and development, receiving 22 votes of the total 41 cast, this is what i want to happen. 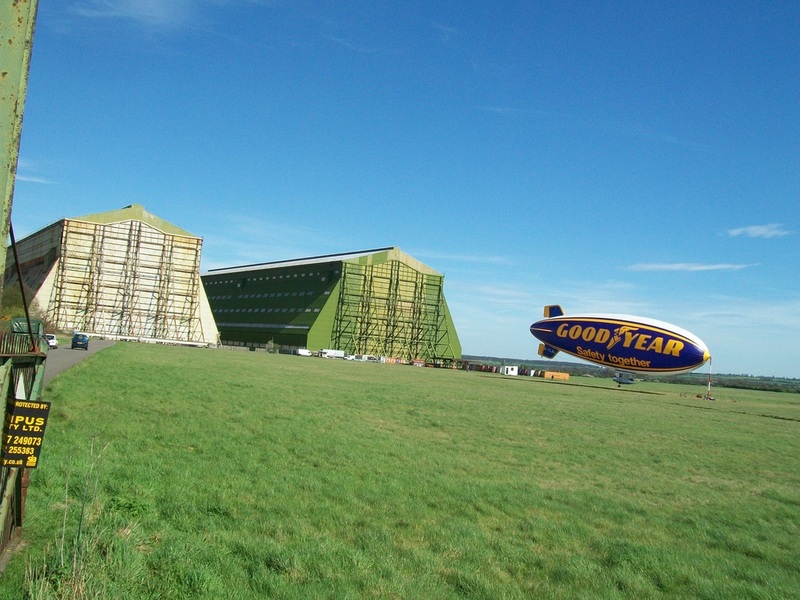 "historical airship museum" receiving 14 votes another high for the poll, this is my second choice but i dont see any reason why you could not have 1 and 2 together, it would work. will joe bloggs head fit in it?? obviously one is a joker, even the Cardington sheds are not that big lol no offense meant. giraffe farming (this question is based on a quote from Roger Munk, "Cardington is only good for two things, airships and giraffe farming" i love that quote. 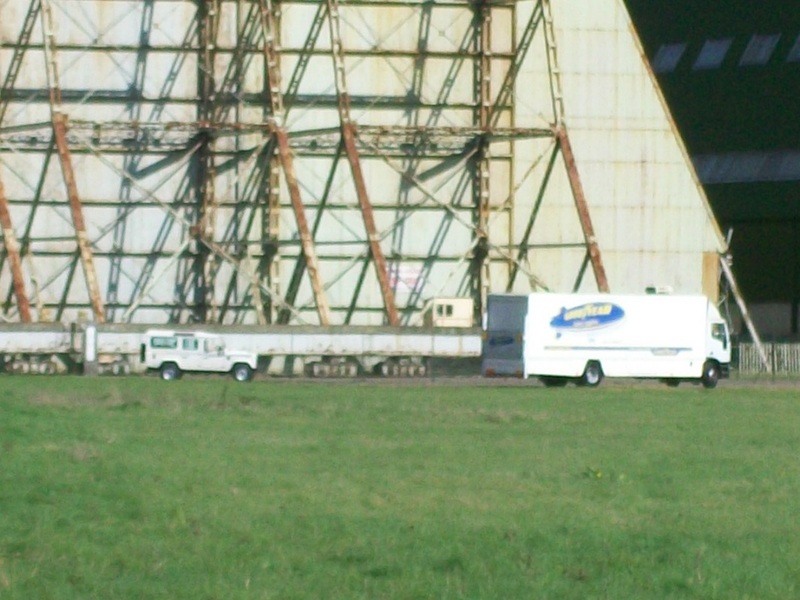 There has been much speculation as to where The Dark Knight Rises will be filming when it starts production in 2011; New Orleans being the major rumor, with some sites even going as far as to “confirm” that to be true. However, not too long ago our pals over at Hero Complex sent out a tweet officially killing that rumor, denouncing it as a “total myth.” With the New Orleans filming theories officially in a casket, we are once again left with the question; Where will The Dark Knight Rises be filming? The answer seems simple because it is. 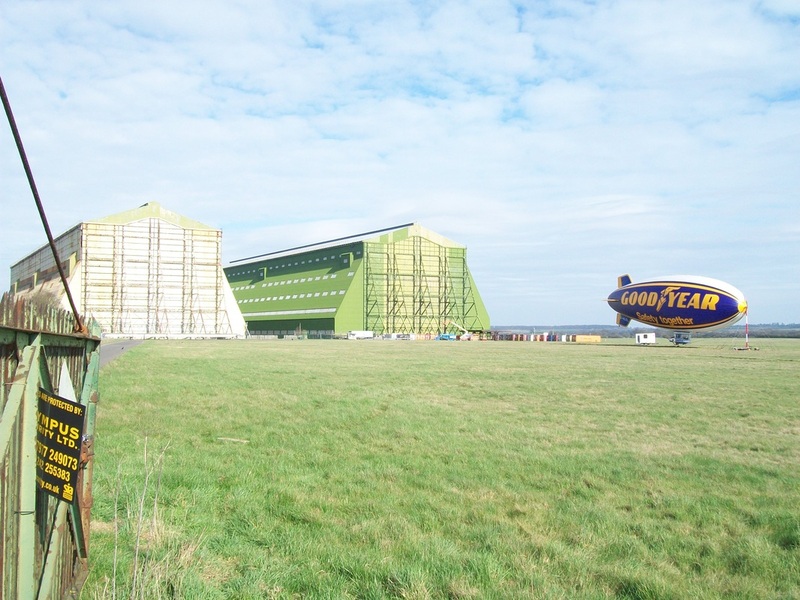 Christopher Nolan’s last installment in his Batman saga will make its return to the Cardington airship sheds in Bedfordshire, England. 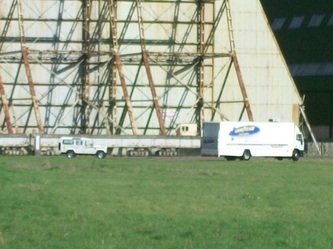 Both Batman Begins and The Dark Knight filmed in the enormous hangers there, as did Nolan’s most recent cinematic outing, Inception. 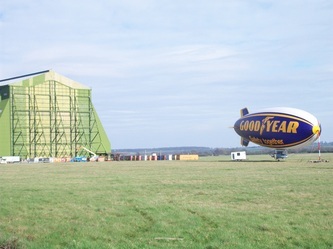 According to Variety, Chris and team will be returning to the United Kingdom to finish the Batman story, as well as to take advantage of the tax credits offered there. 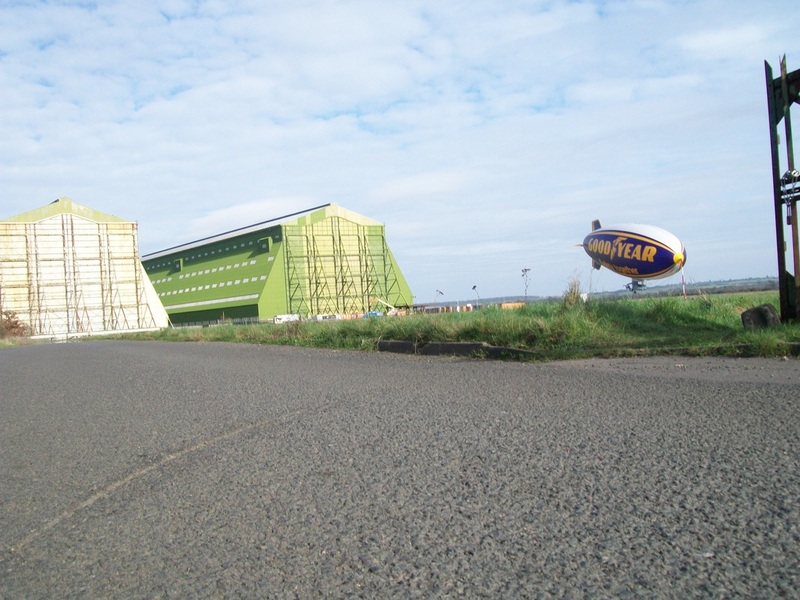 The airship sheds were home to many vast sets in the series, including ‘the narrows’ and the batcave. Perhaps a new batcave will be one of the new sets built inside the hangers? 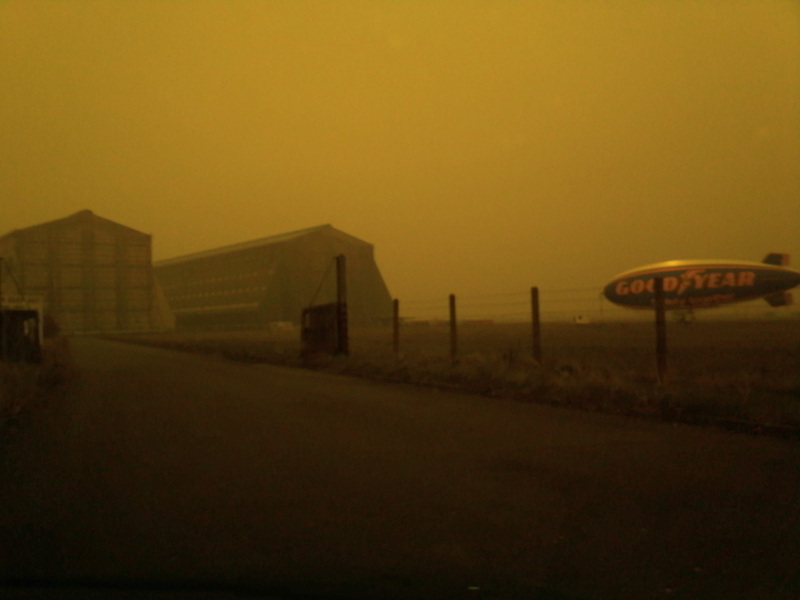 One can hope. Thanks to Shindler2010 in the forums for the tip. Below are the results of the last poll, what airship story should be turned into a film? 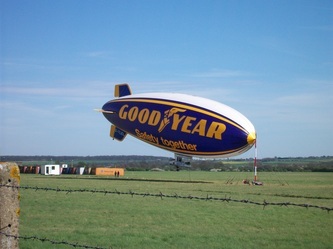 in at 3rd with 4 votes was the Norge, 5th was 3rd was LZ127 graff Zeppelin, joint second was shenandoah and LZ104 African ship, joint 5 was R34 atlantic flight and the R38 , nothing for R33 NS11 and Akron/Macon. 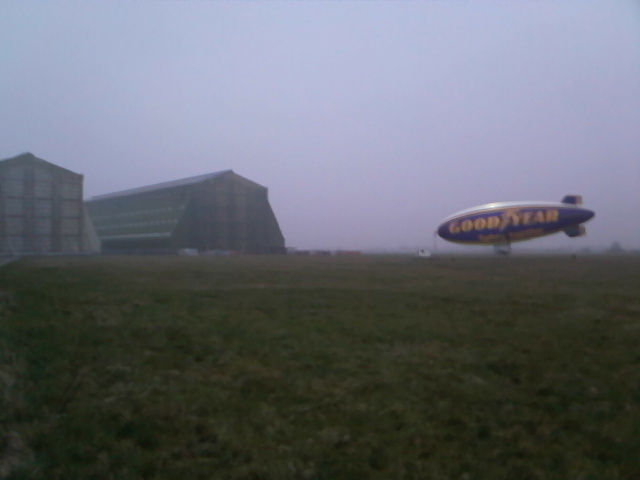 so roll on that R101 movie, it needs to be made. 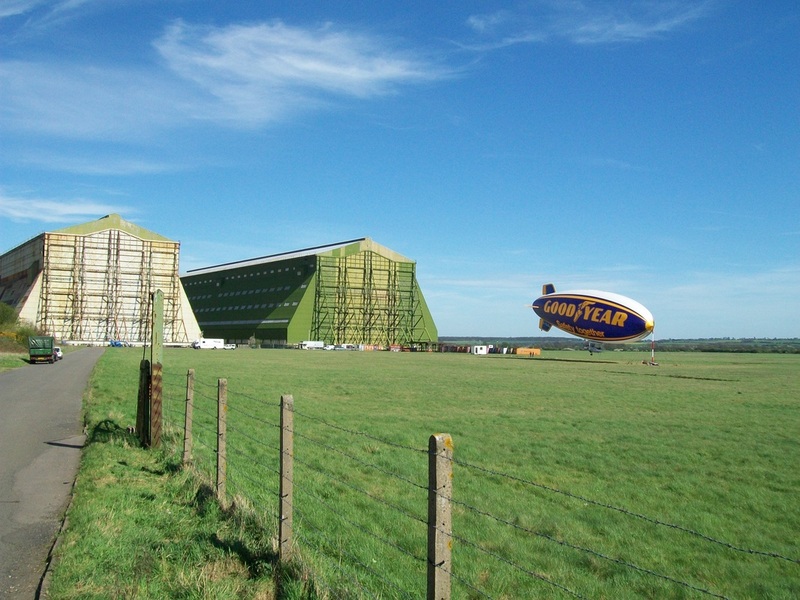 well below are the results from the last airship poll, and the visitors favorite cardington built airship was, drum roll please, R101. still no news on shed 1's restoration, it is deteriorating more and more every year now, the main structure of the shed seems sound however the cladding is failing and the holes in the roof are quite bit now, hopefully the restoration will start next year. 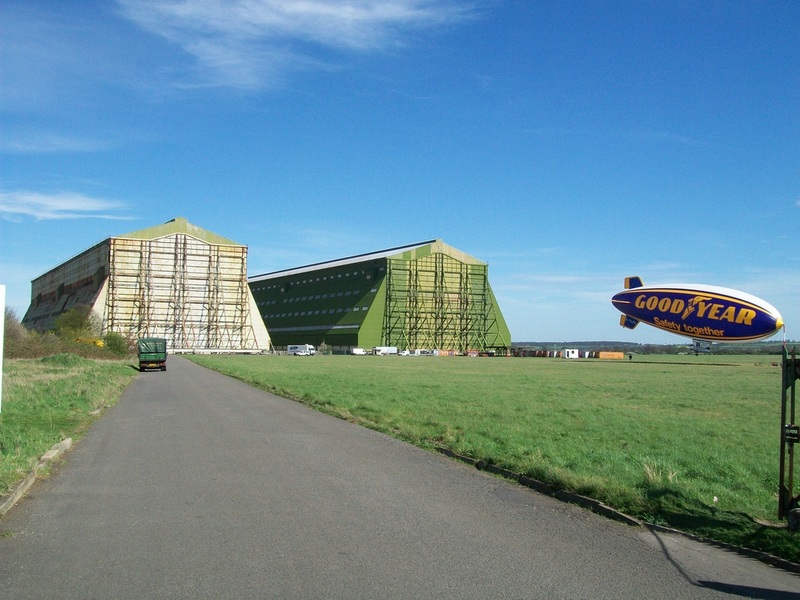 the condition of this fine large building has been left to deteriorate for far too long, lets hope next year will mark the beginning of its restoration.